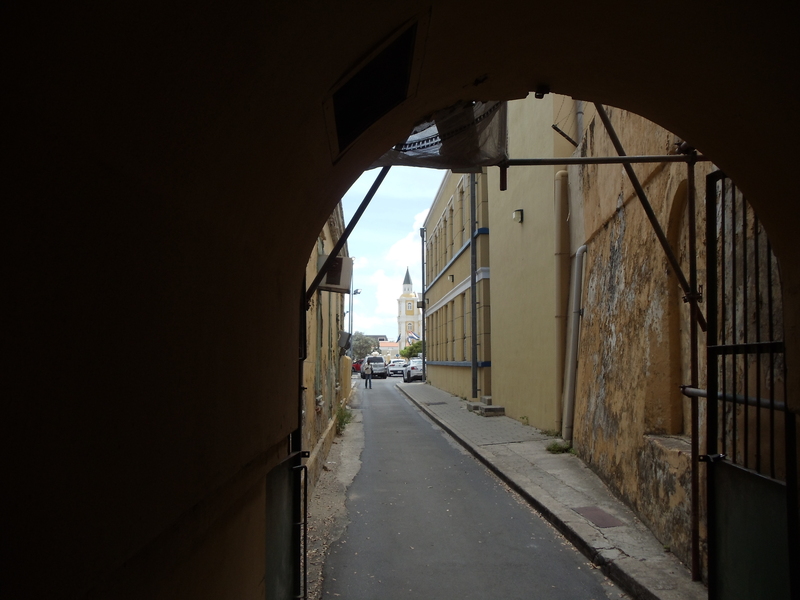 For the last couple of weeks I have been out of the country exploring the Dutch West Indies – specifically Aruba and Curacao. What an adventure! These places have an odd feeling to them. They feel like little bits of historic European cities plopped down into the Caribbean with a mixture of West Indian culture mixed in. Walking down certain narrow winding streets with their thin, ornately gabled, bright and pastel colored buildings and houses, I felt like I was back in Antwerp or Amsterdam. 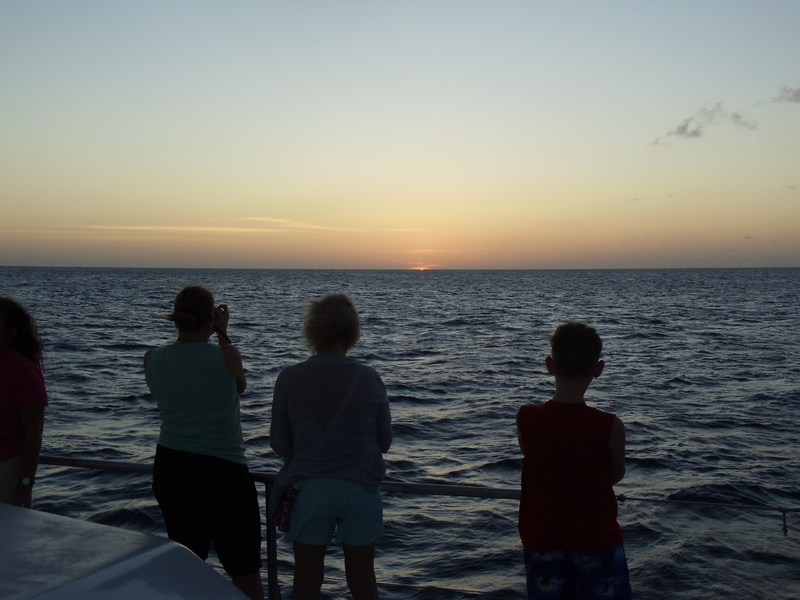 While I saw a great deal, I feel as if I only scratched the surface really and plan to go back very soon for a much longer amount of time – to thoroughly explore Bonaire and Suriname on that excursion as well. The thing that really stepped out at me immediately is that historic sites do not seem to be considered very important in these places which rely so much on tourism for a good part of their revenue. Shopping and Beach locations are where everyone wants to go – and who can blame them. However, I wish there was more information available for the more adventurous and historically minded tourist. I ran into some very erroneous information surrounding many of the historic events and places here. This amazed me and I realized that there is very little published in English on the history of these places. Even the people there that you talk to while exploring know very little about their own history. This was no surprise to me actually. When I worked on a NATO project at the Hague a few years ago, the Dutch Colonel that was taking care of my team admitted to me at dinner that most people there did not know much about their own history – and in fact I knew dozens of times more than he or any officer he had in his command on the subject of their own history. A couple of pretty young professional Dutch ladies I ran into at lunch one day on Curacao (who were working for a PR/social media firm responsible for promoting the restaurant on social media) admitted the same and said they were really not taught much history in school these days. I mentioned the very heroic deeds of several of their heroes and briefly related to them a couple of historic anecdotes. They were very interested, impressed and surprised that they had such great heroes but had never heard of them or of what had taken place. Very sad. That sort of atrophied focus will eventually lead to history and knowledge being lost forever to time. 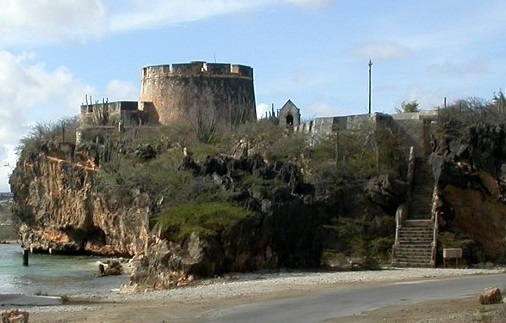 The island of Curacao itself was forcibly taken from the Spaniards by a Dutch expedition in 1634, and settlement/fortification began immediately. This was a planned and very deliberate attack to secure these western-most Lesser Antilles (Aruba, Curacao, and Bonaire: known as “The Dutch Pearls”). The Dutch originally called this area – to include the coast of Venezuela “Het Kraal”. Most American school children are taught that Christopher Columbus discovered America with three ships – Nina, Pinta, and Santa Maria, even if this isn’t completely accurate. 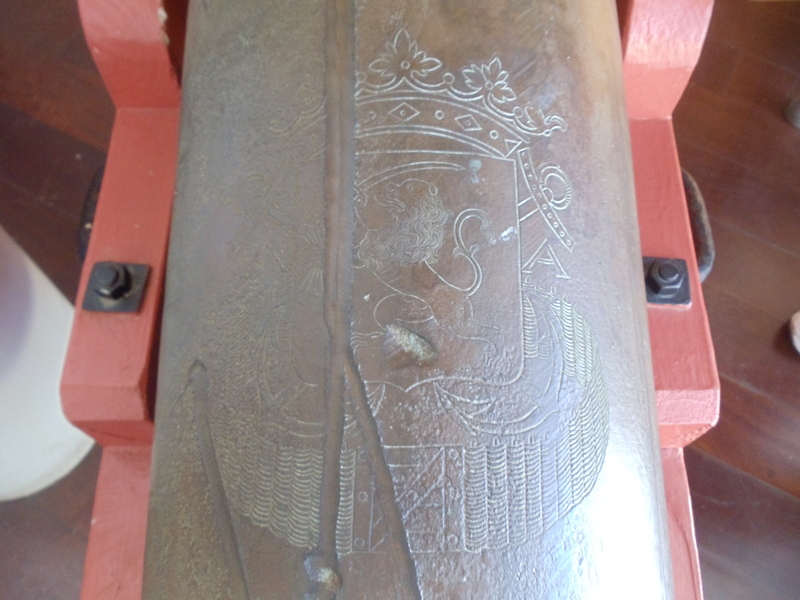 So in this spirit – for any that might be interested in Curacao’s beginnings – I will briefly state the names of the men and ships here that really started Curacao’s story. The expedition was commanded by Joannes Van Walbeeck – an experienced, skilled naval officer and navigator who had circumnavigated the world in 1626. The land contingent’s mercenary captain was the experienced soldier Pierre LeGrand. The ships which landed this force were the Dutch warships Groot Hoorn(Great Horn), Eenhoorn(Unicorn), Brack (literally Speurhond which we would translate roughly to Beagle or Foxhound now), and the Engel Gebriel(Angel Gabriel). There were also two French Biscayan cargo haulers with supplies. According to Goslinga the Dutch had prefabricated forts aboard that could be quickly erected. I find this simply amazing. The Spaniards were impressed by this as well and narratives describing these pre-fab forts were noted in war reports back to the ruling council and as far as Seville to Olivares himself. I already knew that Dutch ships on colonial ventures would sometimes carry pre-cut and quarried stone blocks as ballast. 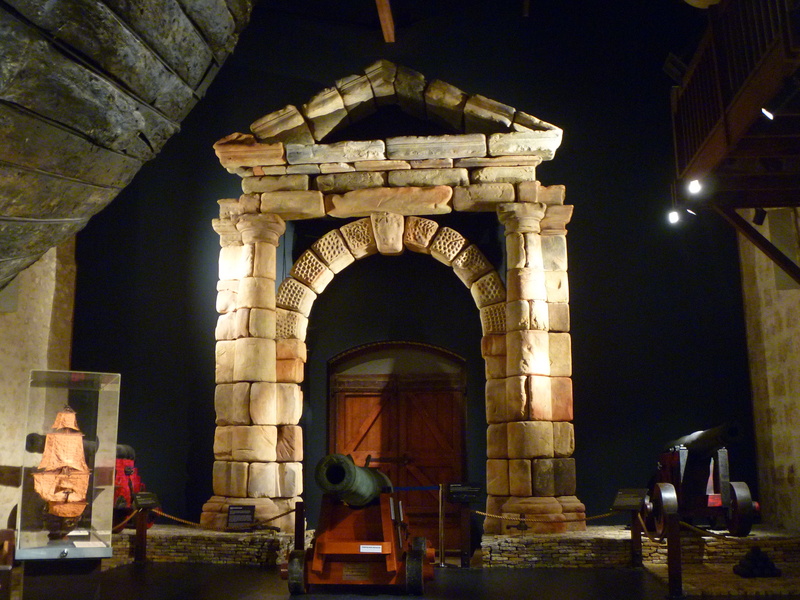 Simply look at the wonderful gate recovered from the 1628 wreck of the Batavia in Australia. The Spanish governor was Lope Lopez de Morla and only about 30 Spaniards were on the island with him including a Mayor, a priest and his twelve children. De Morla had befriended the local Indians (about 500) and they were armed and hidden in support. As the Dutch began landing troops they attempted to parley with DeMorla who refused to come aboard and repeated attempts at negotiation went on for hours. The Dutch finally discovered the Indians in hiding and backed off to form a strong defensive line of pikemen and musketeers. DeMorla initially believed this was simply another Dutch commercial venture to mine salt and cut brazilwood. By the time DeMorla relized that this was actually an invasion force of conquest it was too late. With the entire invasion force ashore the governor fled for the interior of the island, ordering every village/building burned and all wells poisoned with animal hides. Over the course of the next month the Dutch rooted them out of their many hiding spots and pursued them west. They found the wells (which were still good) and deprived the Spanish and Indians of water forcing them to surrender. They were deported to the mainland of Venezuela outside of Coro with the exception of around 75 Indians that agreed to stay and help the Dutch. Walbeeck was given implicit instructions in sealed orders from the Herren XIX(board of directors/ruling council) that he was not to mistreat the local population in any way. This is very interesting given the Dutch record of atrocities in the East Indies. 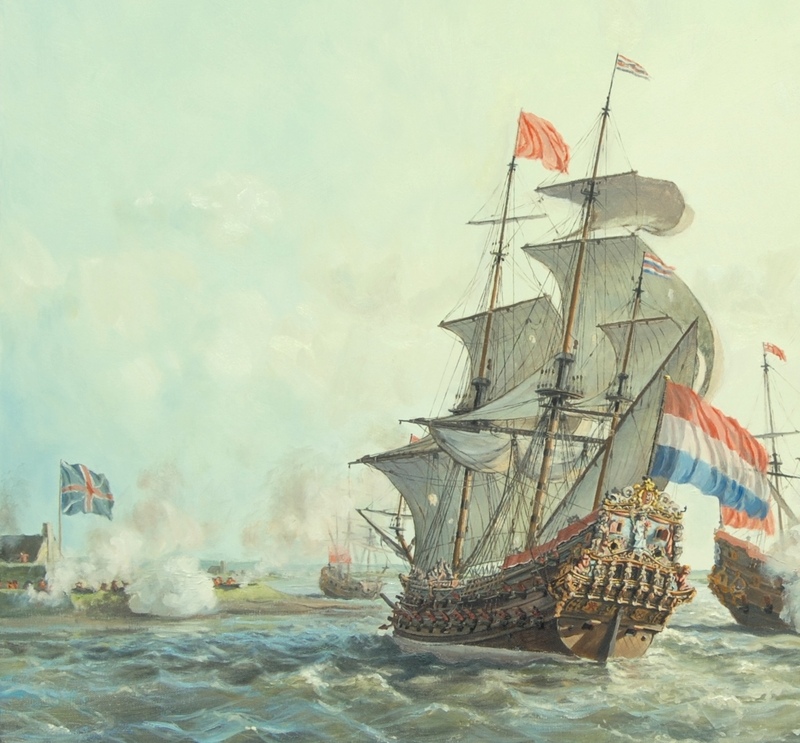 The Spanish account from DeMorla tells a much different story in that the Dutch “Almirante” (which would have been the warship Groot Hoorn), maintained constant and devastating cannon fire upon them – forcing them to retreat inland and giving them no chance to negotiate at all. 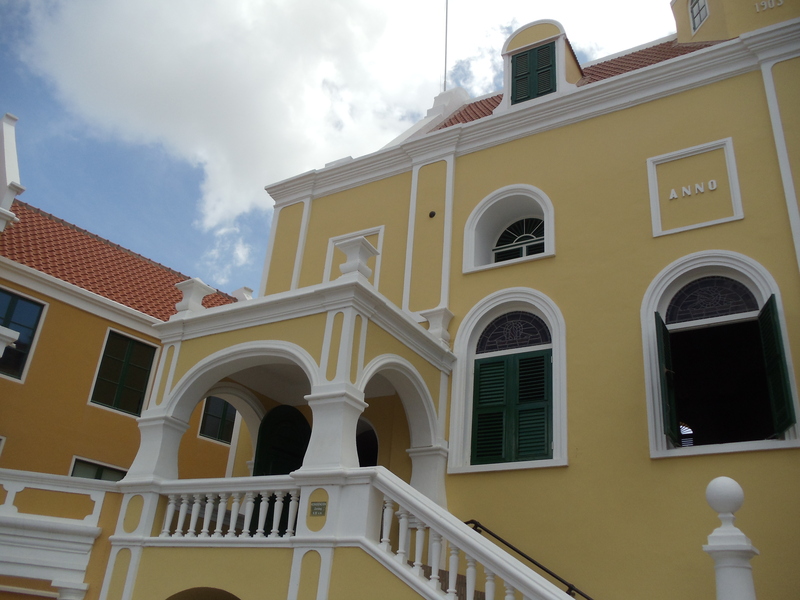 The Spanish governor of Venezuela complained bitterly to the King about the increasing Dutch military presence around Curacao. As a result the King finally financed an expedition (80,000 ducats)to retake the islands in 1641. However, only three war galleons were fitted out and only 300 troops raised. 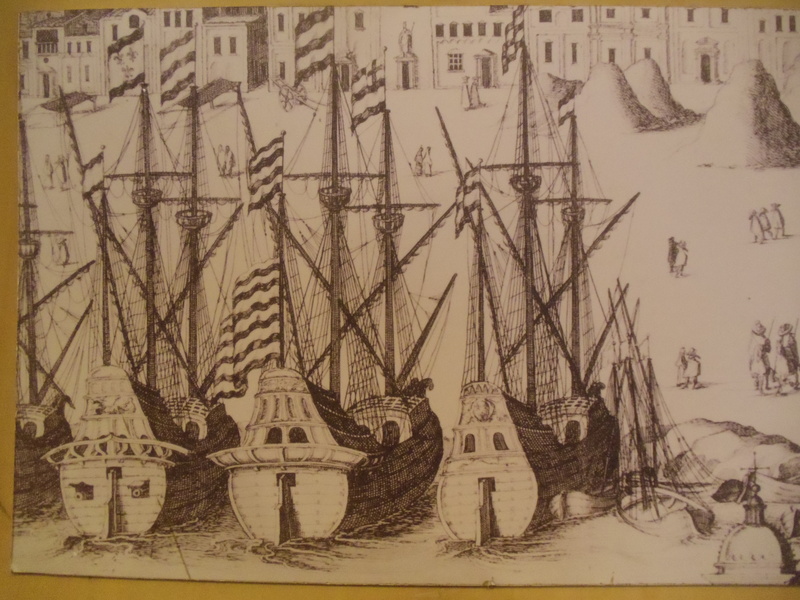 This force did land on Bonaire in 1642 (although some drowned during the landing). The Dutch seeing they were significantly outnumbered abandoned and burned the wooden fort there and fled back to Curacao. The Spanish became sick and the ships became leaky. 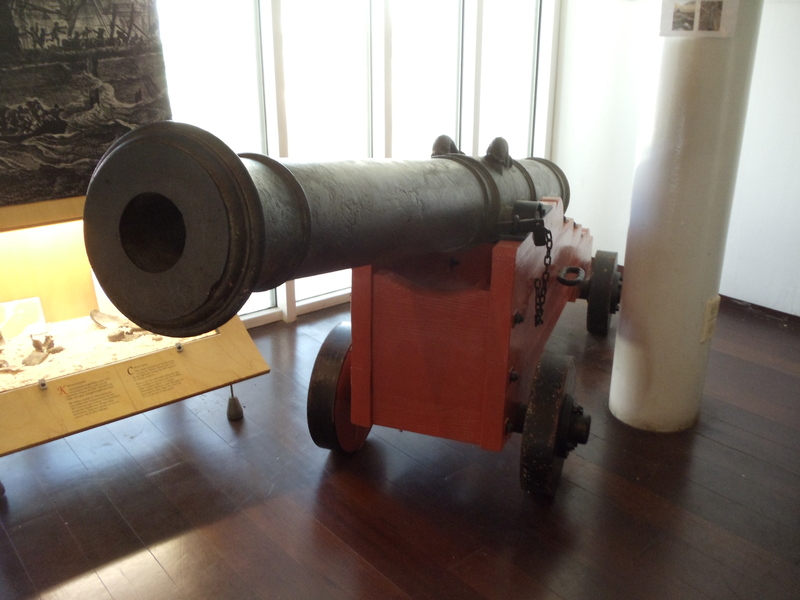 During a war council it was decided that this force could never take Curacao with its now heavy fortifications and hundreds of well armed soldiers. 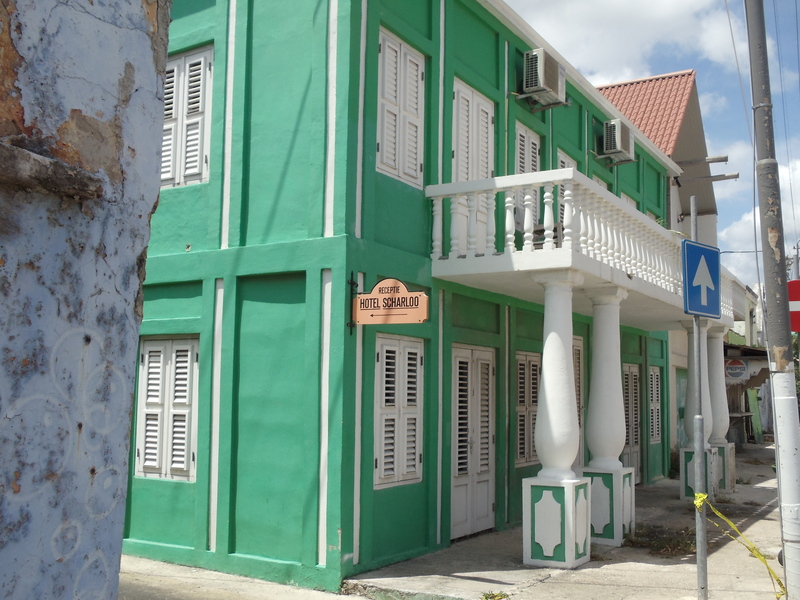 They contented themselves with the killing of hundreds of cattle and horses that had been left on Bonaire to supply Curacao with meat and mounts. 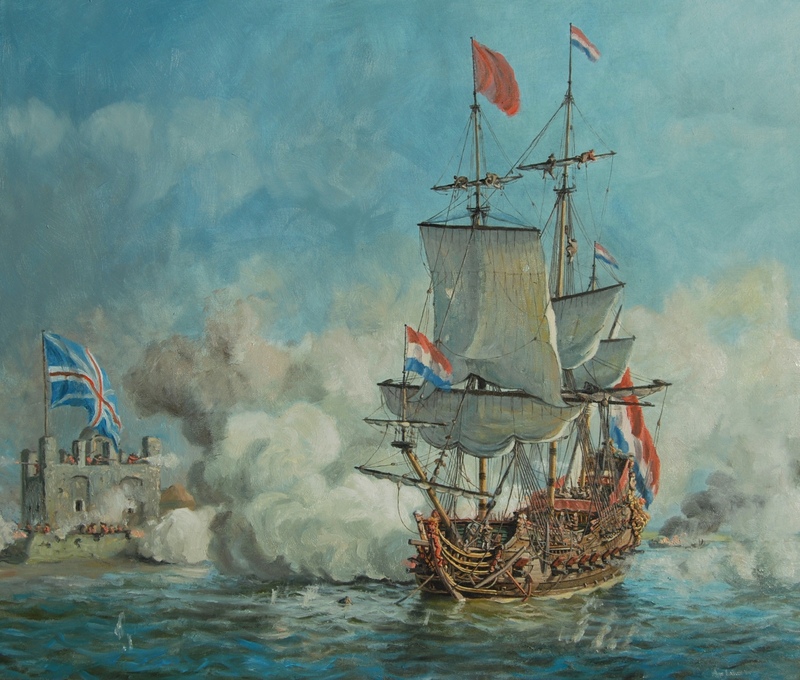 On the trip back to Spanish territory the Spanish galleons briefly bombarded Fort Amsterdam as they passed – an act that they probably regretted with several Dutch warships making pursuit and harassing the galleons with accurate gunnery for hours during their return to Caracas. That was the last and only Spanish attempt to retake the Curacao islands. Peter Stuyvesant conducted a subsequent raid into Venezuela as a result seizing thousands of cows and goats to re-inhabit Bonaire’s pasturelands. In 1648 the long Eighty Years War between Spain and the Netherlands came to an end. During much of the rest of the century Spain was often an ally of the Netherlands. Spain and the Netherlands would not be at war again until the 18th century during the War of Spanish Succession starting in 1701. 1) the Dutch badly needed salt for food preservation within their vast herring trade. In addition it was required for provisioning naval and trading ships with salted herring en route to their many far flung colonies in Africa and the East Indies as their primary source of victuals. 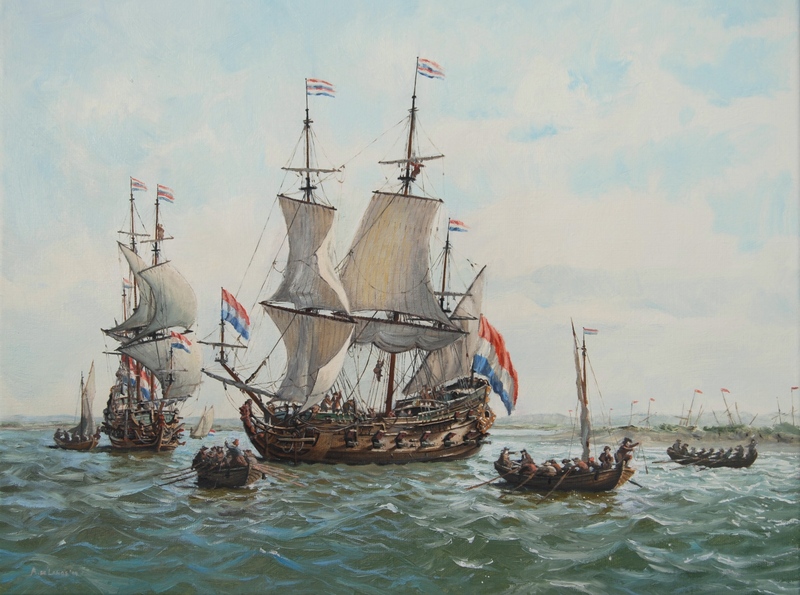 This was no small task in that the Dutch trading fleets numbered around fifteen-thousand ships at this time(compare this with England which possessed a fraction of this amount with only around one-thousand trading ships at the same time). The long war with Spain had closed most sources of salt (salt pans) to the Dutch and this caused the navy to openly support armed expeditions into Spanish held territories to seize salt pans and remove large quantities. These particular islands were known to contain salt that had been taken previously by Dutch ships stopping there to cut brazilwood which was also a desirable commodity that could be obtained there. 2) The Spanish had forcibly retaken Sint Maarten the year before and the Dutch desired a better, more permanent, well fortified base of operations to populate and expand into the West Indies. 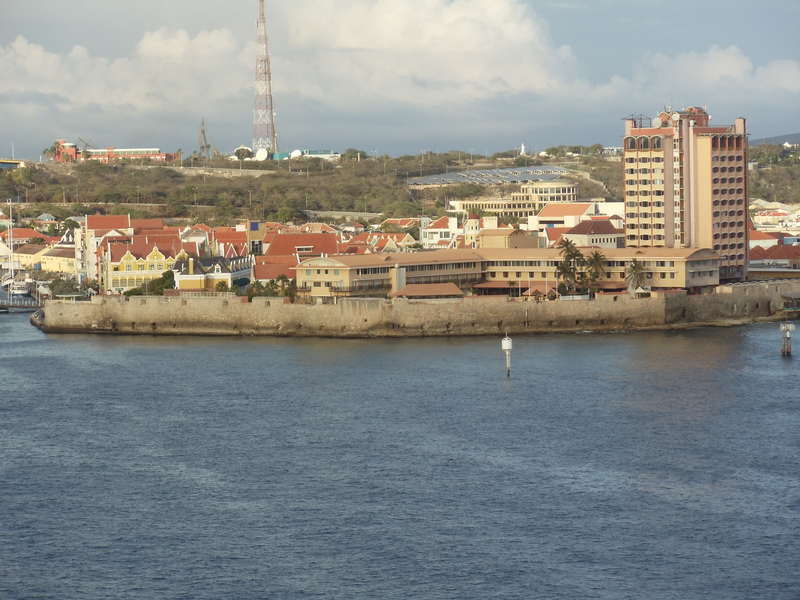 They planned to take as much territory as they could from the Spanish and Portuguese using Curacao as a home base of naval operations and a staging area. *NOTE: indeed Piet Heyn had already begun the conquest of Brazil in 1624 with the seizure of the Portuguese capitol of Salvador. The Dutch occupied and held the majority of Brazil for the next 30 years until the Portuguese natives rose up in rebellion in concert with a large military expedition which finally retook a large part of it in 1654. 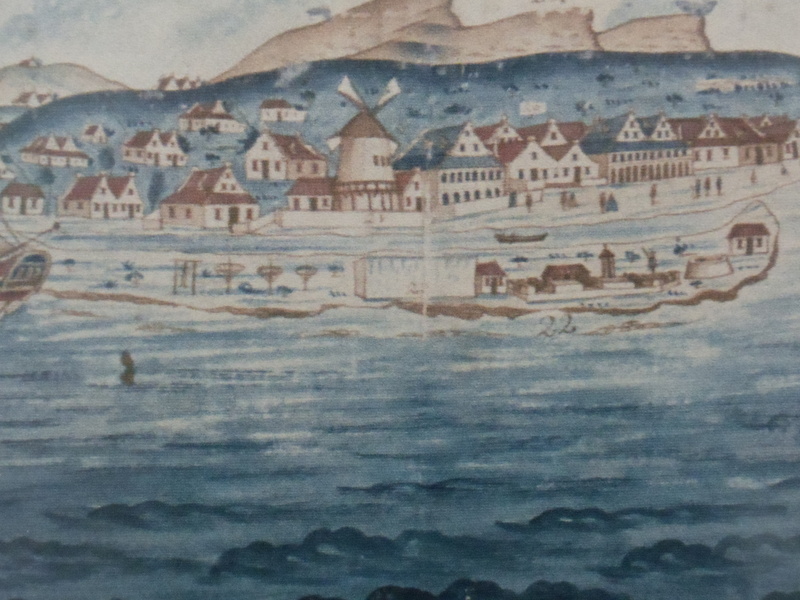 As an amusing side anecdote, the reason the harbor at Sint Anne Baai(Bay) and the settlement site of Willemstad was chosen was because of one man – Jan Janszoon Otzen. Otzen was an adventurer that had been captured by the Spaniards and forced into hard labor cutting brazilwood on the soon to be Dutch islands. He escaped and made his way back to Holland obtaining an audience with the Heeren XIX. He convinced them he was intimately acquainted with the islands and could guide them to the best places to settle and fortify. 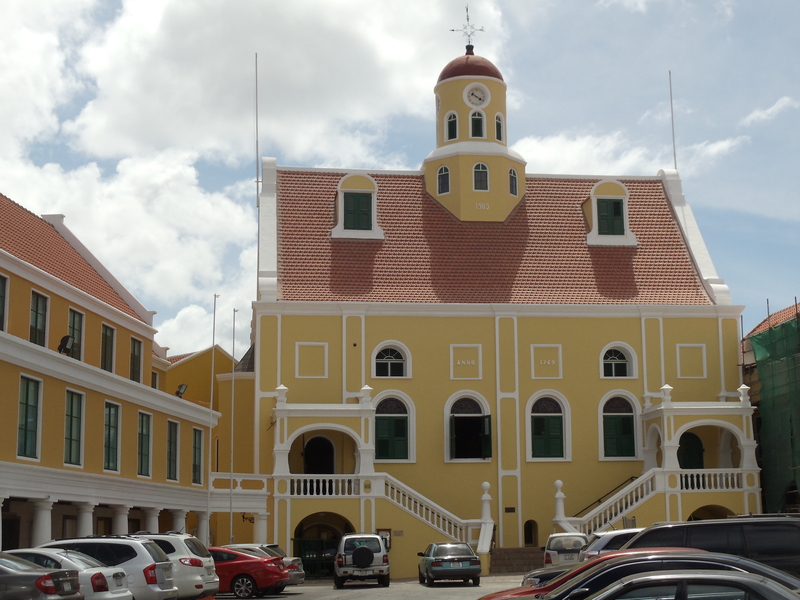 In reality we now know he was a bit of a scammer who in truth had seen very little of the islands – and some of the other harbors on Curacao (“St. Joris Baai” or “St Barbara Baai” [also called the Spanish Water]) may have actually been better suited to the original task at that point in time and for the ships of that age when considering prevailing winds, currents, and defensibility. 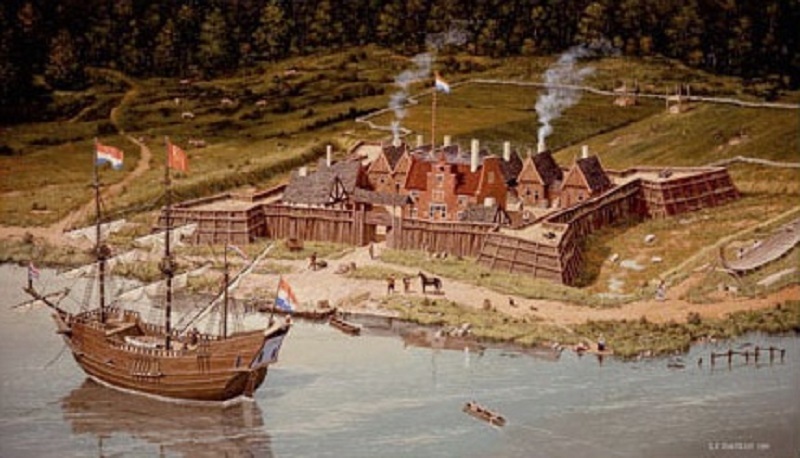 Regardless, the Dutch set to work making Willemstad and Fort Amsterdam their fortified capitol in the New World. Once Fort Amsterdam was complete they set about building forts on every vulnerable landing point and waterway on the island. It is also fascinating to note that this 17th century Atlas leaves out many details of the interior of this well settled and heavily fortified island with only minor details of estuaries and harbors showing their mouths only. 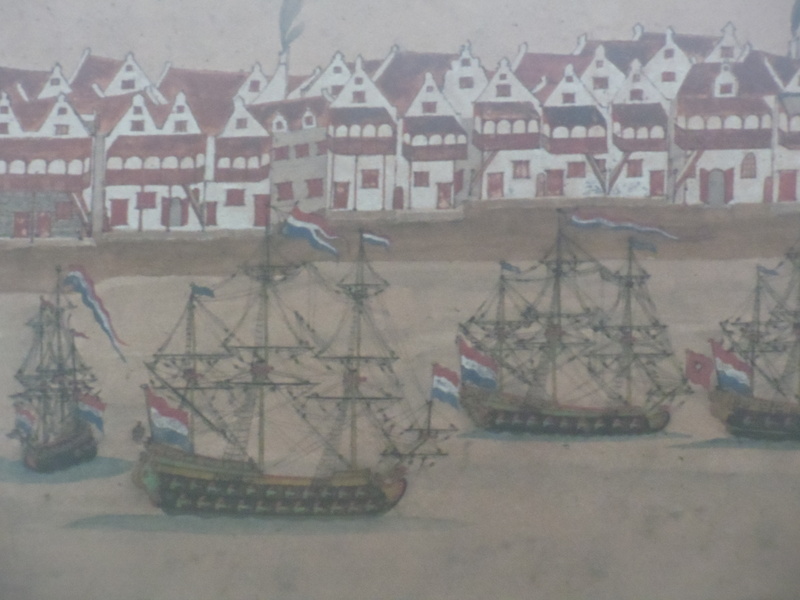 The interior of the Shottegat which is the large sheltered harbor behind Willemstad where the naval base was and where many dozens of ships could dock simultaneously – is almost left off the map with very little detail. I believe this is very deliberate as this atlas is printed in English and was produced for sale to English navigators at the time. 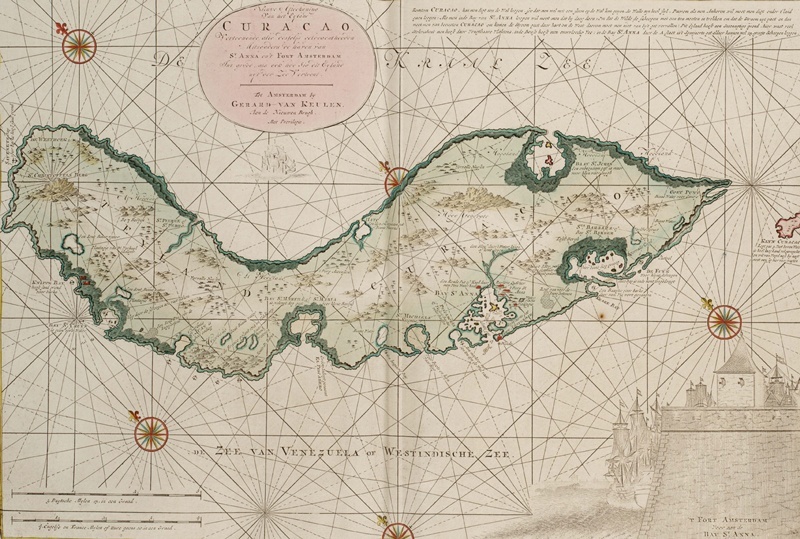 Strategically Curacao was extremely important to the Dutch state and the Dutch West India Company(WIC). It was a major commercial hub and arguably the slave trading capital of the western hemisphere until around 1680 when Jamaica surpassed Curacao in this dark industry. 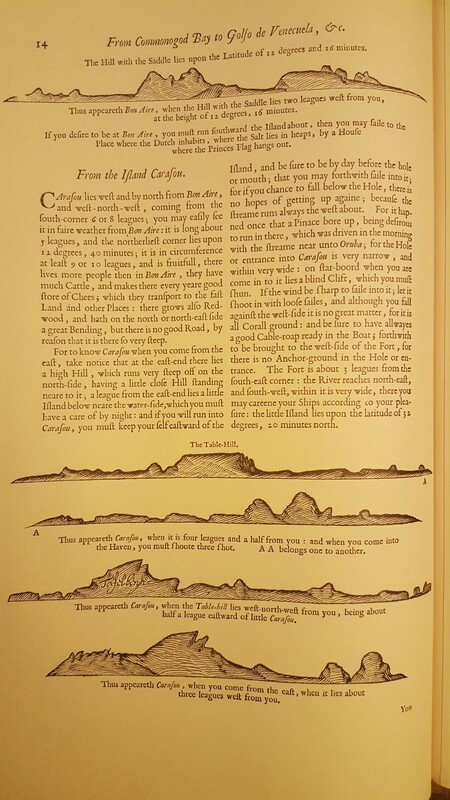 Illustrating the interiors of those estuaries, harbors and their defenses was probably considered too secret or sensitive of information to put into the atlas and so only the necessary detailed coastlines with views from multiple directions, wind, anchorages, soundings/depths, landmarks, etc were recorded in the Atlas for Curacao. The later 1675 version (Seen below) was made after the end of the wars with France and England and while the forts are still missing, many of the interior details are now included. The Dutch were known to do this in many places, however they are also well known for upgrading these places with stone over time – often a very short time. We have records of stone Dutch forts guarding seized Spanish salt pans on the mainland coast of Venezuela – and the Spanish taking them and dismantling them – using their stone blocks for local construction projects. Many fortified places in Europe suffered the same fate with locals using them as quarries over time as their towns expanded and defense became less important. I suspect that many of these 8-11(+) sites on Curacao may have suffered the same fate. 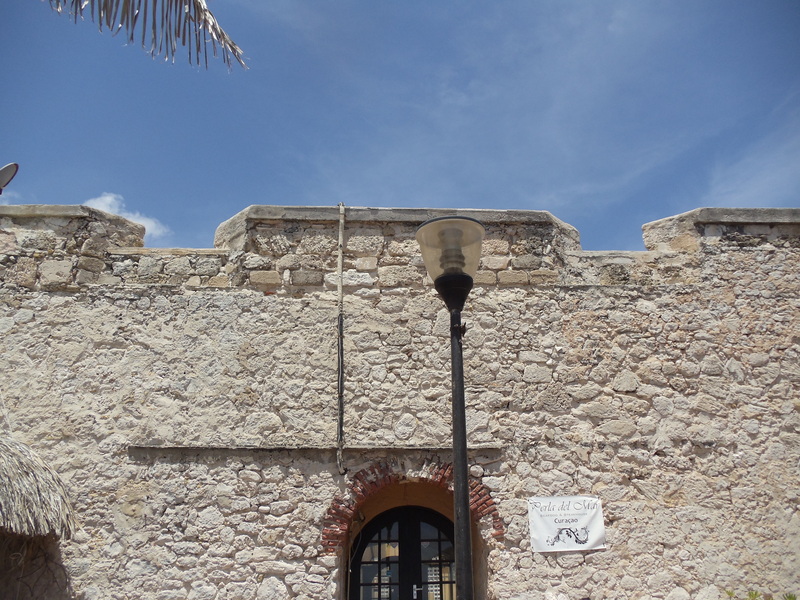 It’s also possible that the oil and gas industry that descended into Curacao in 1915 and is a major industry here now, and who are responsible for preserving at least one fort: Fort Beekenburg (dated 1703 but also built atop an older previous fort found on the old maps. (see illustration)), – could also be responsible for dismantling some of the old obsolete forts that were just in the way of progress. In my passion to find some of the other forts I poured over old maps and compared them to Google Earth and other satellite imagery. I actually discovered a few! A former fort called Fort Saint Marie which sat on a high hill overlooking Port Marie is now gone but if you look closely on Google earth there are the outlines of square and rectangular wall foundations atop the hill. Its remnants still exist and these are the kinds of places I like to explore. Also funny enough I found a privately owned home located in another Fort’s location which was originally called Fort Engelenberg. The prominent multi-storied house has a large low THICK(like over four or five feet thick) square stone wall all they way around it and painted yellow – the same color as the house. Wonder what that house used to be eh? Maybe a fort? 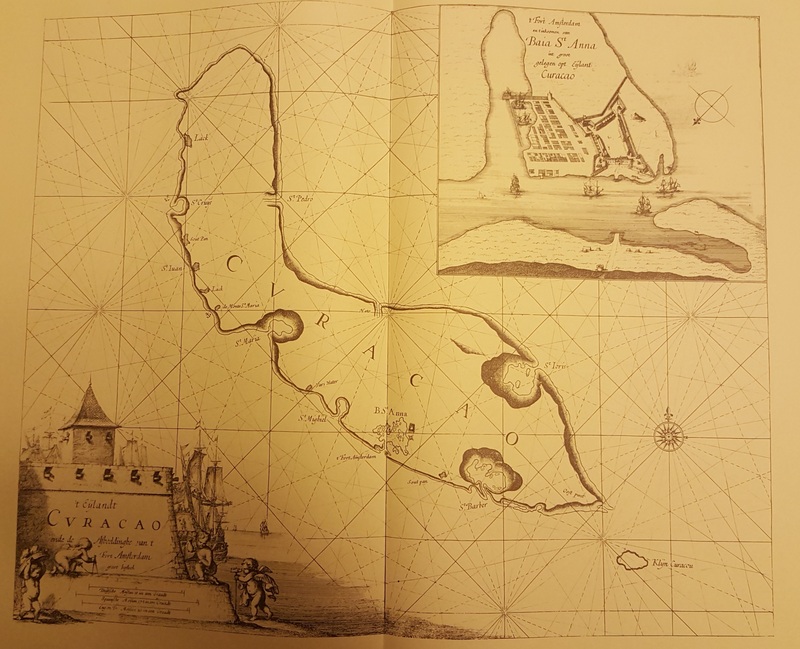 According to several old maps there was also originally a small fort just west of a place labeled on the old maps as “Duivels klip” close to Curacao’s East Point. Google Earth wasn’t giving me the views I needed so I turned to one of my favorite websites – Flash Earth – and tried NASA Aqua satellite imagery. I was able to make out several conspicuous shapes that could have been old towers not far from a large modern communications transponder tower. I believe there was originally a fort there as well with a look-out to watch that approach. Another interesting place that the old map illustrations show is a very prominent fort at “Piscadero Baai” (some call it Pirates bay now) just two miles west from the Rif Fort on the far southwest corner against the sea there. It is shown as a large strong square stone bastion and is unnamed on the 17th century maps. However on the 18th century maps it appears as a heavy walled gun battery with a single L shaped wall facing the water and it is named Fort Piscaderos. A large Hilton hotel and resort is there now and I plan to stay there on my next visit and explore the looping foot path that now occupies the place the fort once did. Perhaps I can find some remnants of cut stone next to the sea there. This would be a perfect place to build a replica fort of the original for tourism purposes as it looks as if there are no buildings at all there according to the satellite imagery. It looks like a park now. I will walk around this area when I go back. I believe this to be a very historic site and the place of several of the battles where enemy troops were landed just out of range of Fort Amsterdam. I believe this was the fort John Bligh seized in 1804 and the French first seized in the 1800 invasion. Last there were definitely two gun batteries on the south side of St. Joris Baai oriented north in order to defend the only good and sheltered anchorage on the northern approach into Curacao. The Forts are named Groot St Joris and Klein St Joris. The satellite imagery shows that the coastlines have changed a little over time in comparison to the old maps. The water level appears to be higher all around the island. The clear outline of a C shaped wall facing east can be seen revealing itself out of thick trees and vegetation at the site of Groot St Joris and is flooded in the water. Another L shaped wall is very prominently visible on the heights above to the east at Klein St. Joris. EDIT: I found two more forts during additional research. One is called Fort Waakzaamheid. It is not on any of the old maps I have. It is on a hill about halfway between the Rif Fort and Fort Pascaderos inland north from the coast about 3 quarters of a mile. This is the fort where much of the fighting occurred around between Captain JOHN Bligh and the local militia in 1804. There is a restaurant there and I plan to visit and eat there on my next visit. I have not been able to find anything reliably dating the fort yet. The next is called Fort Sint Michiel and sits about two miles further west of the Hilton resort (and former site of Fort Piscadaros). It guards Sint Michiel’s Baai with its guns oriented west over the beach there. There is a small village there now called Boka Sami. I don’t know how old it is. It is not on any of my old maps either. I will keep digging. Plenty of place for me to go to on my return visit in a few months and a lot of fun places to explore. In addition, I think there was a 15th fort that no longer exists. 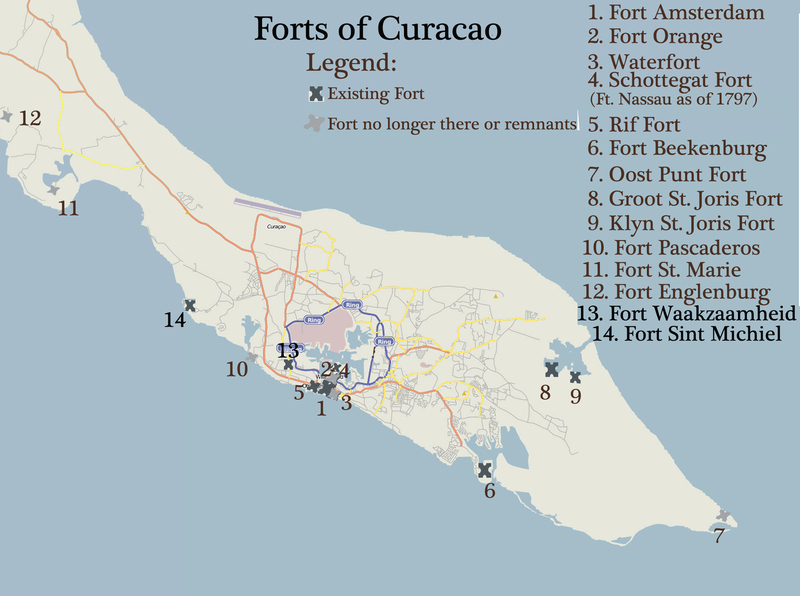 I originally thought that the fort on the Shottegat known as Fort Nassau after 1797 was the same fort seen on the very early maps of Curacao. After taking another hard look at the old maps I am convinced that they are two different forts. I firmly believe that there was once an additional fort on the north side of the Shottegat. That area is incredibly industrialized now and the fort is probably long since gone and lost to time. It would be an admirable historic venture to perform a survey of all of the possible and known sites and compile the historic information for posterity and modern historical interest/tourism purposes. I made a map. I think folks will find it useful as there is no good modern map that I could find showing these fort locations. Could there be other forts I can’t find on the old maps or on satellite imagery further west or in other places? Based on my professional judgement as a historian and senior military officer – and if I were a betting man (which I am) I would say… very probably yes. Perhaps I shall have to write a book on the subject one day. I mean I only have the twelve books I am currently working on – and have not finished even one of them yet eh. Three of them are very close to being finished now I am excited to say. 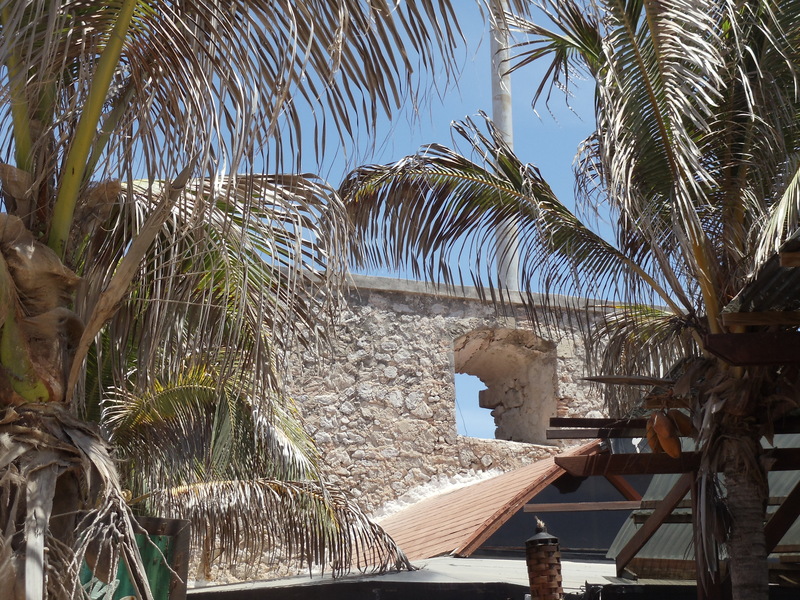 Another thing that leapt out at me was that the dating of many places on Curacao only record the final date of upgrade to the building, fort, etc. However the original dates of construction from previous buildings/forts on the same sites have been mostly lost I’m afraid. This would lead one to believe that many of the historic sites here aren’t nearly as old as they actually are. For example, the Fort Kerk(church) in the middle of Fort Amsterdam is dated to 1769 and the tower on top 1903. 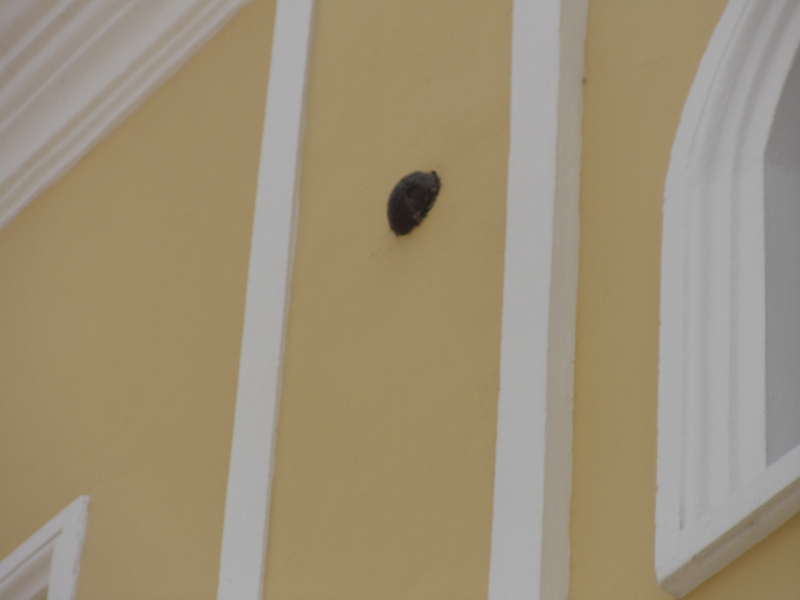 However, when one looks at historic illustrations of Curacao made in the last quarter of the 17th century a very similar church can be seen with a very similar tower and could have been built over a hundred years before. Indeed I believe that based on Goslinga’s account that reports were received by the Spanish War council in 1640 at Coro/Caracas – relaying that extensive and formidable heavy stone fortifications had been completed, causing the Spanish to abandon hopes of ever retaking Curacao. So I pose that similar and simultaneous work would have began on improved stone buildings as part of the fortifications, e.g. headquarters, barracks and church. One only need look at the dozens of still existing 17th century fort ruins in the East Indies to realize that this was simply how they did things. Goslinga records that Governor Peter Stuyvesant hosted a dinner here for a Spanish spy in his fine residence located in the middle of the fort (Waterfort) which overlooked the bay of St. Anne – in 1642. I questioned the curator about the original wood church on that site because according to my sources they built a wood church there in 1634. However the only one she knew of was on the opposite side of the Queen Emma bridge and she said it burned during the British attack of January 1804. Another amusing anecdote is that everywhere you go that has some small listed history of the island (and on the web) there is an erroneous factoid about this 1804 attack and it being led by the famous Captain (actually Lieutenant at the time) Bligh of Mutiny on the Bounty fame. One website I found even listed the Bounty as the ship that bombarded Curacao. 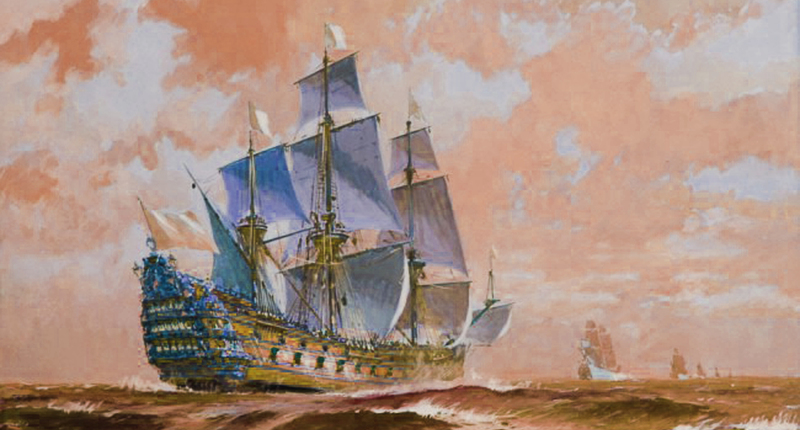 I had a good laugh – a collier – a ship so small it wasn’t even rated – known NOT as HMS but HMAV (His Majesties Armed Vessel) with pretty much only little swivel guns as ordinance – could bombard a well fortified major Caribbean city! She would have been sunk by the fort’s massive 24 and 36 pounder guns in minutes. In truth it was Captain JOHN Bligh (a distant relation of William Bligh) who led a well armed and manned naval squadron to attempt the taking of Curacao based on flawed intelligence: that it was not well defended and the small garrison had suffered from a sickness. He led the 74-gunners HMS Theseus and HMS Hercule, the frigates HMS Blanche and HMS Pique, and the schooner HMS Gipsy. They took Fort “Republique” (An obvious French revolutionary name reflecting the will and influence of Napoleon on the Dutch at that time, who renamed the conquered United Dutch provinces “The Republic of Batavia”). I believe this “Fort Republique” was probably a renamed Fort Pascaderos. At first I thought it might be the “Riffort” (Fort Rif) but that fort was not built until 1828. While the old maps do show what looks to be a low round tower in its place, the 18th century illustrations show a windmill there. There is also a low wall along the channel there in the old illustrations, but anyone landing there would be under constant cannon fire from Fort Amsterdam. I believe it is possible that the original wall and low round tower there might have served another purpose of anchor point for a heavy chain boom that could span the mouth of the Sint Anne channel winched taught from Fort Amsterdam to prevent enemy entry into the harbor and otherwise left loose at the bottom for ships to pass over. This was a common practice during the 17th century in many fortified ports, however I cannot yet prove this. 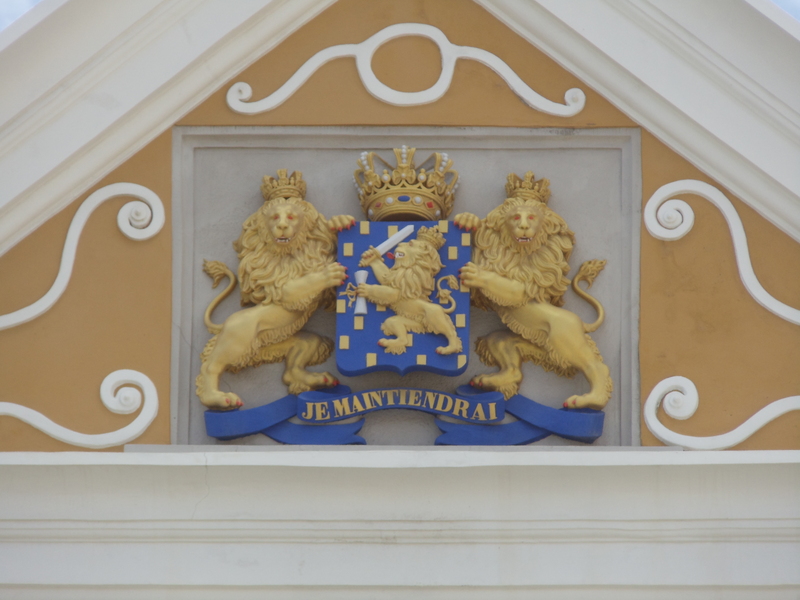 For nine years the Brits ruled Curacao, finally returning it to the Dutch at the end of the Napoleonic Wars in 1815. It has never been invaded since then although the Germans did briefly shell oil refineries there with U-boats during WWII. 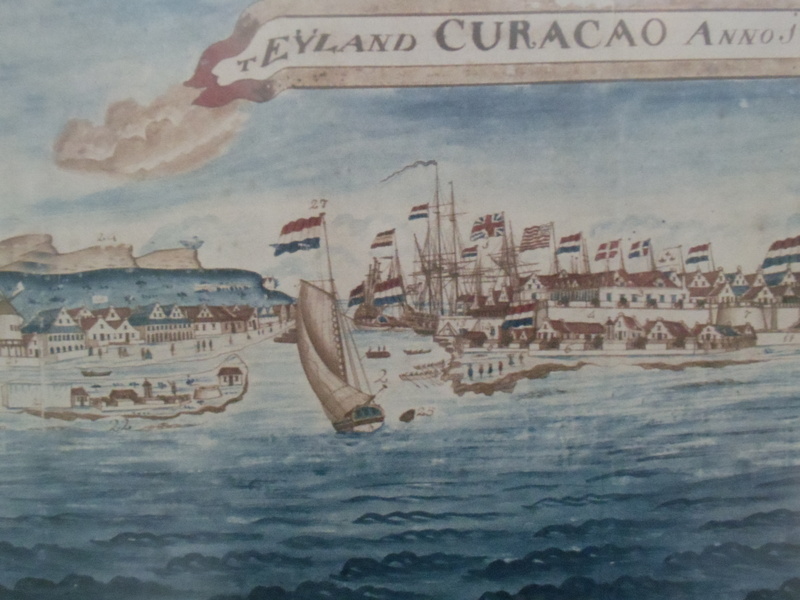 During the Anglo-Dutch wars, attacks on Curacao were planned several times but they were never executed. A different (easier) target was always selected. Bonaire was briefly attacked by the English during the Second Anglo-Dutch war but it was more of a raid and it was not seized or held. 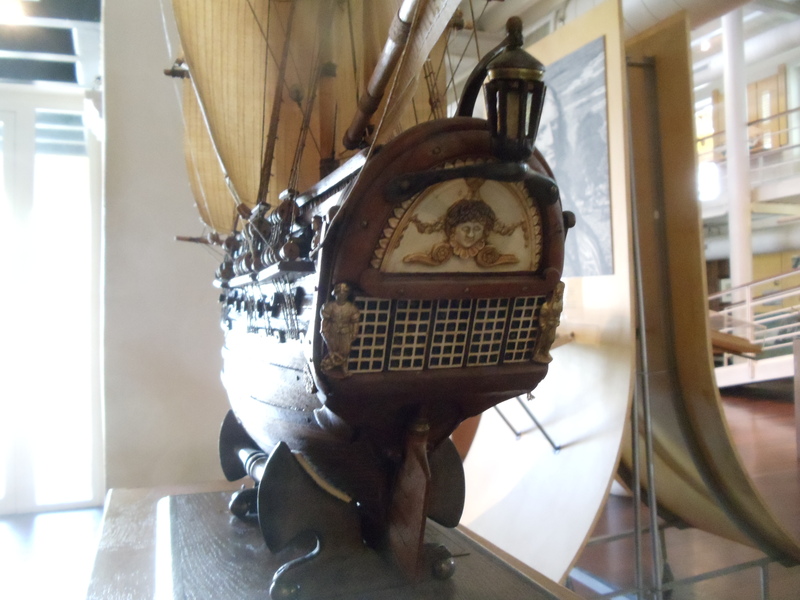 I have found several references to piratical attacks against Curacao on tourism websites and webpages about Curacao, however, they never provide any details – simply stating that pirates were driven off by the local fortifications, etc. I guess it’s possible, but I think this might be erroneous hype to promote tourism which I find completely unnecessary given Curacao’s very rich REAL history. I will continue to dig and research. 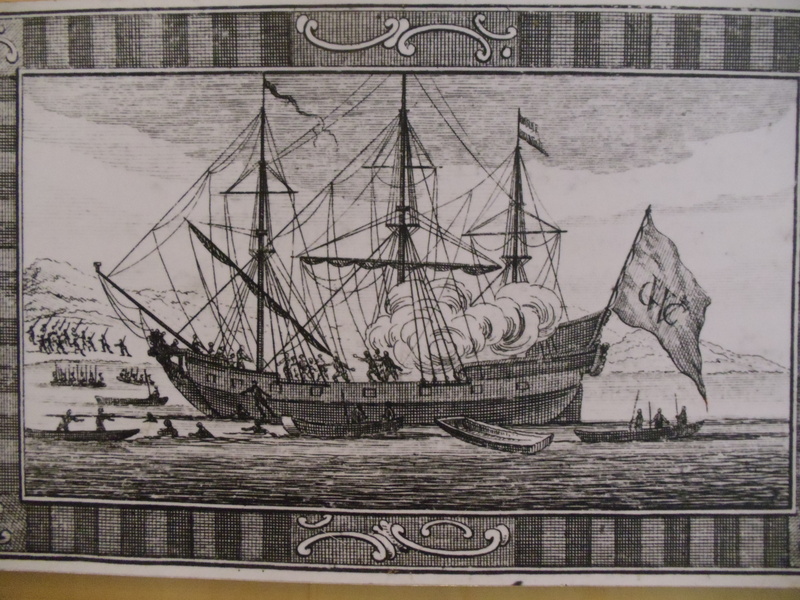 Currently, I have been able to find no evidence of pirate attacks on Curacao other than Cassard’s famous 1713 attack which was conducted by French naval forces, privateers and buccaneers in concert under Cassard’s command. 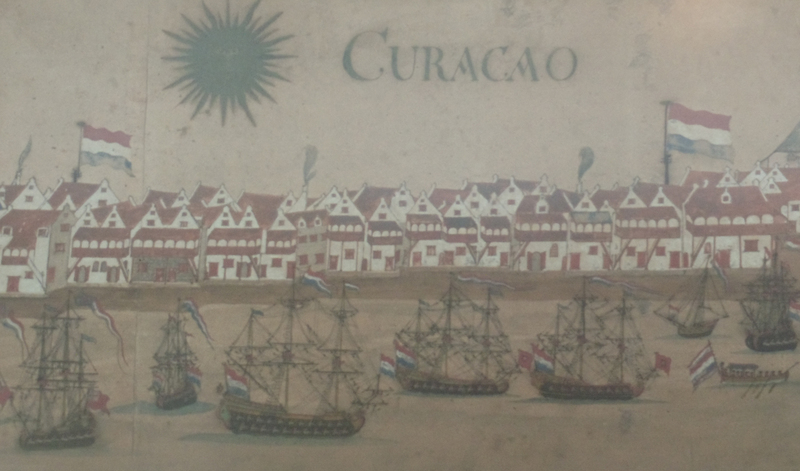 The defense and battles surrounding Curacao always make for the most interesting reading, but Curacao’s real importance has always been about trading and commerce. During the Dutch war with Portugal (1602-1661) Dutch-Portuguese War the Netherlands seized most of the Portuguese Forts in West Africa. As a result the Dutch began trading in slaves in the first decades of the 17th century. Of course there was illegal slave trading and smuggling of slaves from Curacao from the 1640s onward (especially to the Venezuelan mainland) until the Dutch abolished slavery in 1863 (one of the last nations to do so). It should be noted that the Dutch West India Company actually treated slaves quite well (some accounts say better than the poorly paid crews). They actually had the slaves sign contracts and they were considered human and did have some rights. As a fascinating aside some of the first black slaves brought to New Amsterdam (now New York City) by the WIC in the 1620s actually negotiated their contracts to gain better living quarters and work conditions. However, by the 1660s much of this original formality was done away with, and the booming slave trade was Curacao’s primary economic impetus. Black slaves were brought to Curacao to be sold to (middle-men) slave traders/transporters who would then take them to English, French, Portuguese, and later American towns to be sold for an even higher profit. 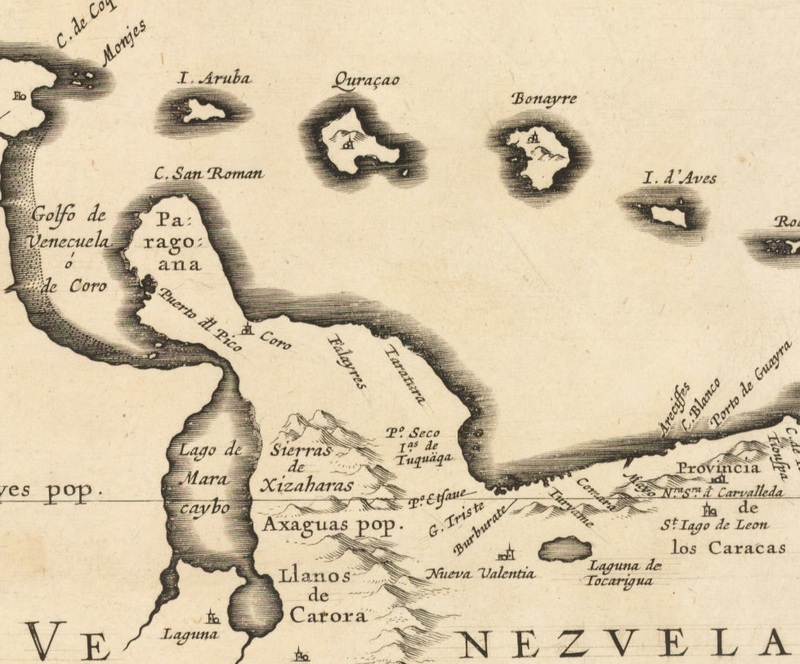 (or in the case of the many active smugglers in Curacao to various locations on the Spanish Main – especially to the Venezuelan towns in close proximity) At the conclusion of the Franco-Dutch War and Third Anglo-Dutch war Curacao was made a free port in 1678, meaning that ships of all nations could enter and dock at the port with very relaxed inspections, cargo and lading fees. This was largely to stay competitive with Jamaica which was becoming the more popular port to buy slaves in and by 1680 enjoyed even more traffic than Curacao. In the illustration below (from about 1674-1688 I think) notice the English snow and large English sloop in the foreground. Both are flying their own nation’s colors (Cross of St. George) from their main-masts and the Snow is flying a Dutch “flag of convenience” from the sprit-mast for trading purposes. I believe this illustration viewed from the west bank of the St. Anne channel tells us a lot but is also a little cartooney. For instance look at the massive amount of ordinance crammed into the ramparts of the fortress. The gun crews would be on top of one another with the guns so close together. I think there was probably a little more spacing but it does serve to show that the artist was very impressed with the armaments and so exaggerated slightly. Also notice the large Dutch man-o-war in the channel. It’s through the ships that we can really date the piece. 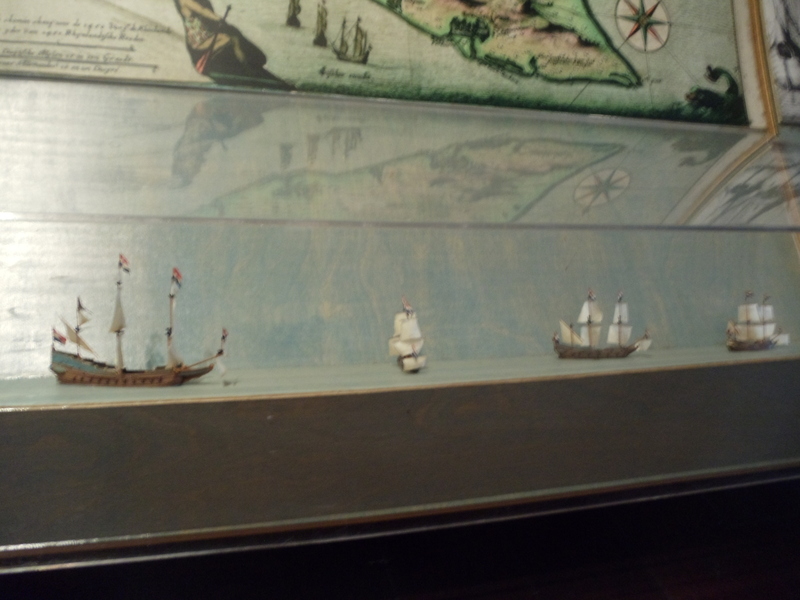 These ships are very typical of the Dutch pattern warships produced between 1660-1690. It’s possible given the long service lives of many ships the illustration could be as new as 1700. 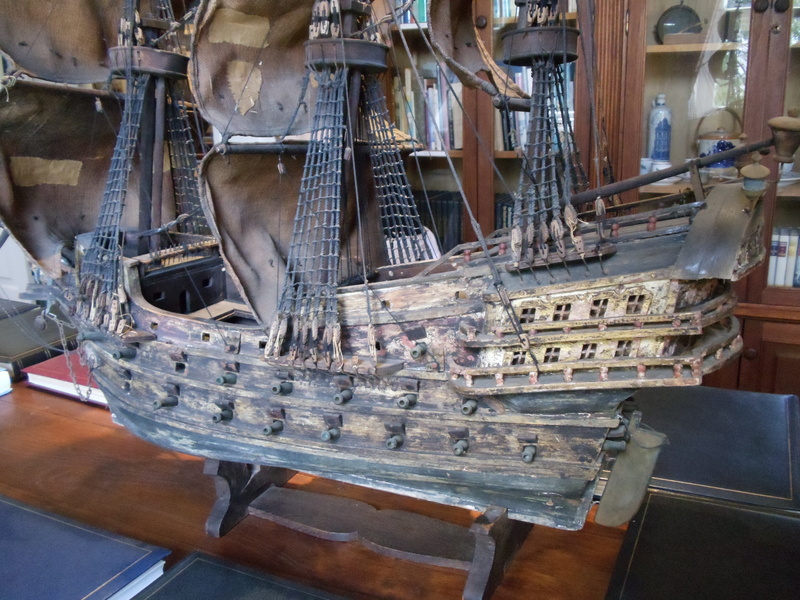 The largest Dutch ships of this era were always two-deckers with fairly flat bottoms to safely navigate the many shallow ports the Dutch possessed both in home waters and abroad in the Netherlands’ many global colonies. We see one of these large manowar in the foreground supported by numerous smaller single decked Dutch frigates of the same timeframe. 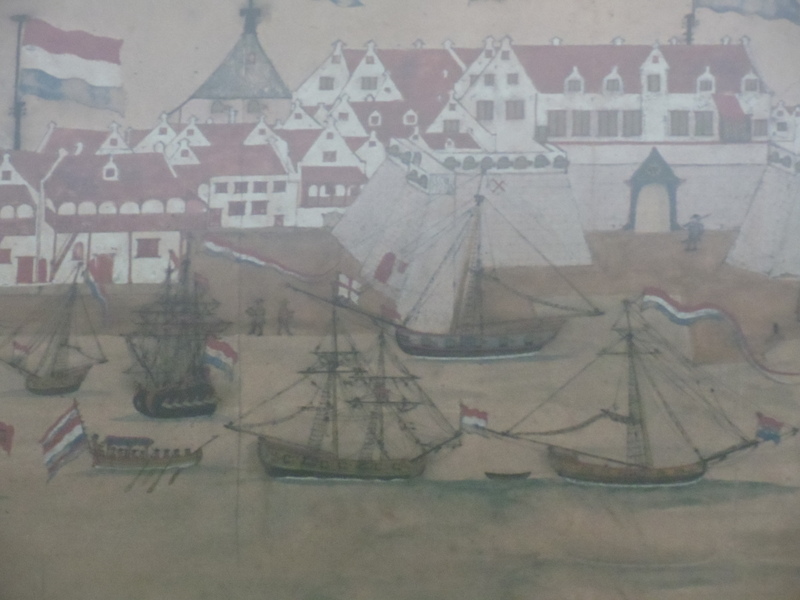 The ship second to the left of the manowar (lower left corner in the picture above) appears to be an English naval vessel or armed merchantman flying a typical English naval flag of the time from the tafferel with the Cross of St. George quartered in the upper left of the solid red field. She is flying Dutch “flags of convenience” for trading purposes from her other masts which was standard practice in a foreign port. If she were a naval ship from after 1688 she and the other ships around her would be flying both English and Dutch colors together (because the nations were joined under one king, SEE: DUTCH INVASION OF ENGLAND If she were a prize taken in time of war she would not have the English flag still flying from the tafferel. So we can now date the picture from before The “Glorious Revolution” of 1688 and after the end of the Third Anglo-Dutch War (1672-1674), hence my assessment that the piece is from sometime between 1674-1688. 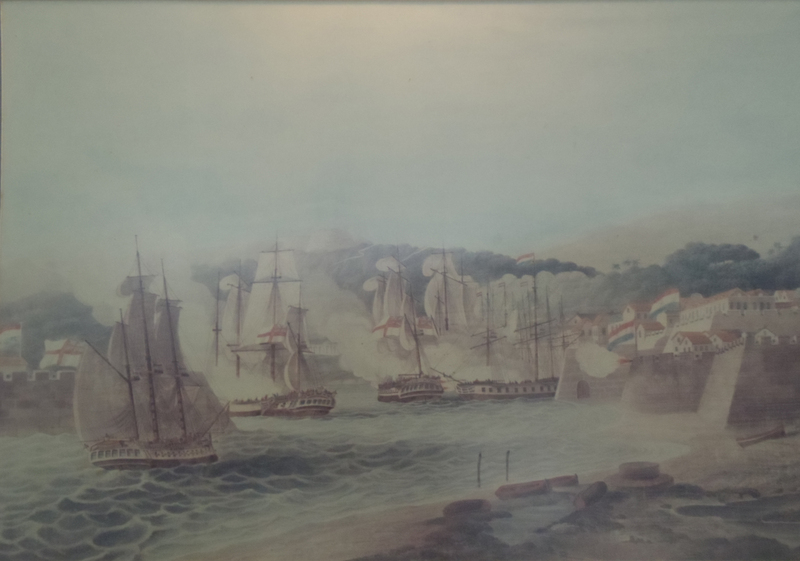 In the next illustration (above – which dates to 1791), the Dutch Golden Age is long over and there are no more large warships to be seen protecting the harbor now. This would have been a rarity in the late 18th century – although there does appear at least to be the stern of a Dutch frigate peeking out from behind the west wall of Fort Amsterdam moored around the corner. Take notice of the sand bar-like island in the foreground. This is no longer there. 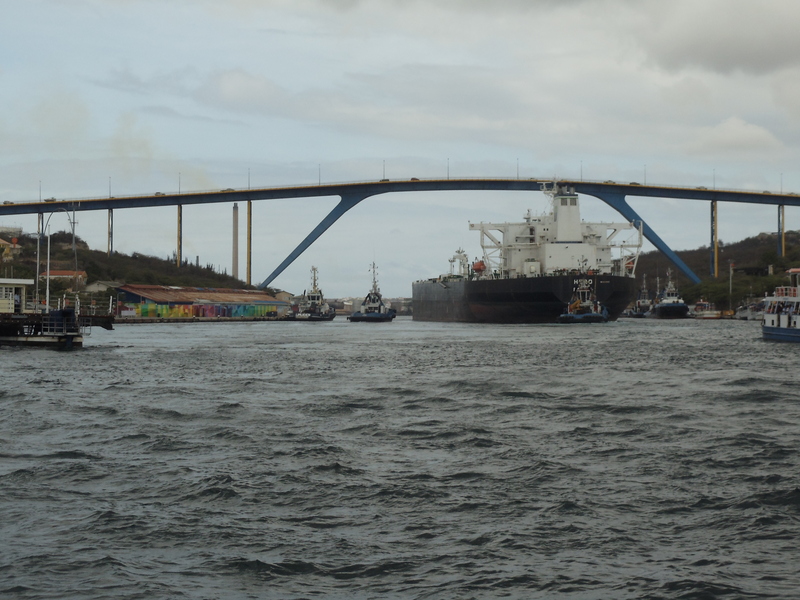 (either joined to the main island or no doubt long since dredged deep to accommodate larger and larger ships: See picture below of an oil tanker I witnessed passing through the Saint Anne channel) In fact some of the old maps show two sandbars there. Notice the buildings on that island and the gallows. In addition notice the execution “wheels”. This was a unique type of capital punishment practiced in northern Europe and I was surprised to see the wheel still being used this late. They are commonplace in old woodcuts and illustrations (Bosch paintings) from two-hundred and fifty years before during the 14th through 16th centuries, but I thought the practice would have surely been discontinued by 1791. The Spaniards still preferred garroting during the same period – lining up pirates in rows behind stakes to be strangled by twisted ropes until the neck broke and the entire tongue grotesquely protruded. In fact, the last Spanish public garrote execution was in 1897 and inside prisons in 1975. So I wonder how long the Dutch punishment of breaking by wheel continued? Fascinating! The sand bar obviously serves as a very deliberate place of incarceration and execution in order to warn criminals and pirates entering the port at the mouth of St Anne’s channel that this could be their fate as well if they did not behave themselves while in port. Its also fascinating to note that there are some low defensive fortified walls on this island. This has me wondering if this could simply be the later site of the Riffort and that the Dutchmen over time reclaimed the land between the little island and the windmill on the west side of the channel. After all the Dutch were (and are still) experts in land reclamation from the sea. One would not be able to avoid the sight of the dead criminals considering the location. Also notice criminals tied to stakes on the east side of the channel as well. It was common practice for thieves, pirates, and smugglers to be displayed publicly until they rotted after they were hanged. 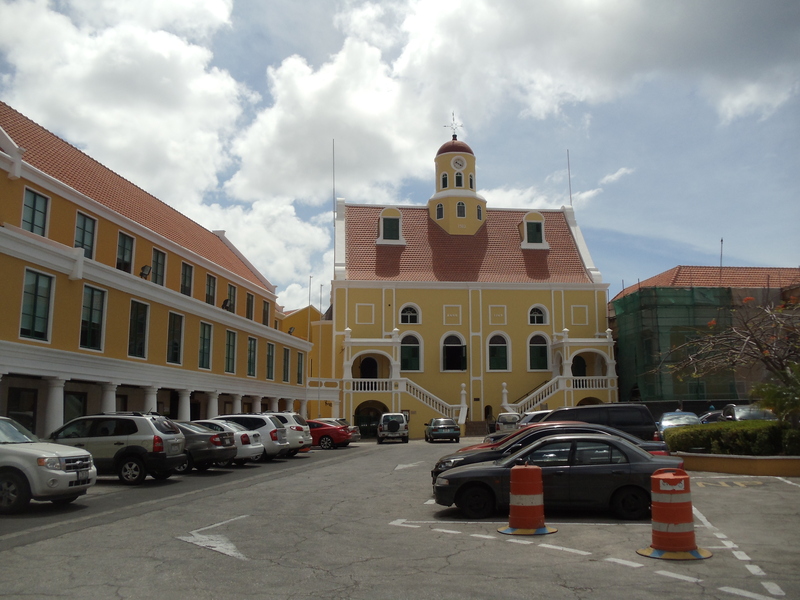 Its very likely, as a bustling free port and known smuggler’s hub, that there were packs of criminals in Willemstad throughout Curacao’s history. 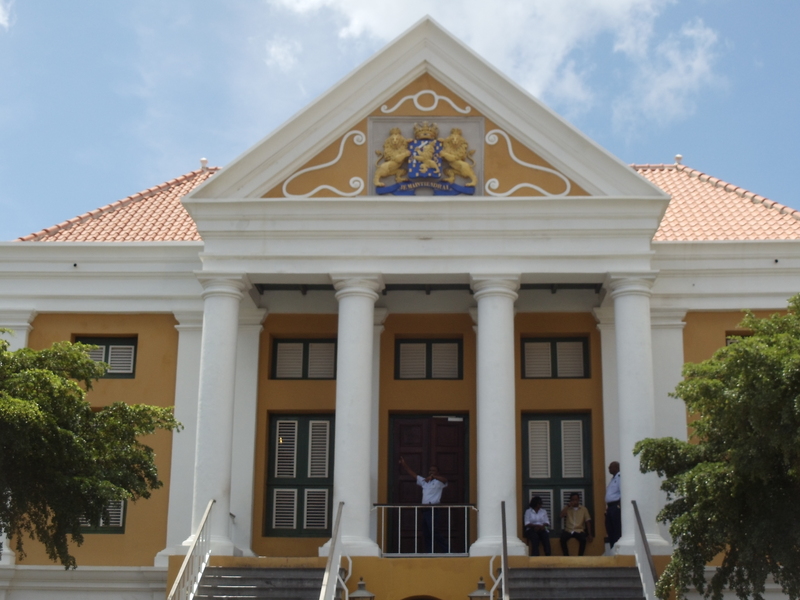 A fascinating scholarly paper would be an examination of existing and surviving papers which detail the trials and executions of said criminals in Curacao – noting how many pirates and smugglers were among the bunch. 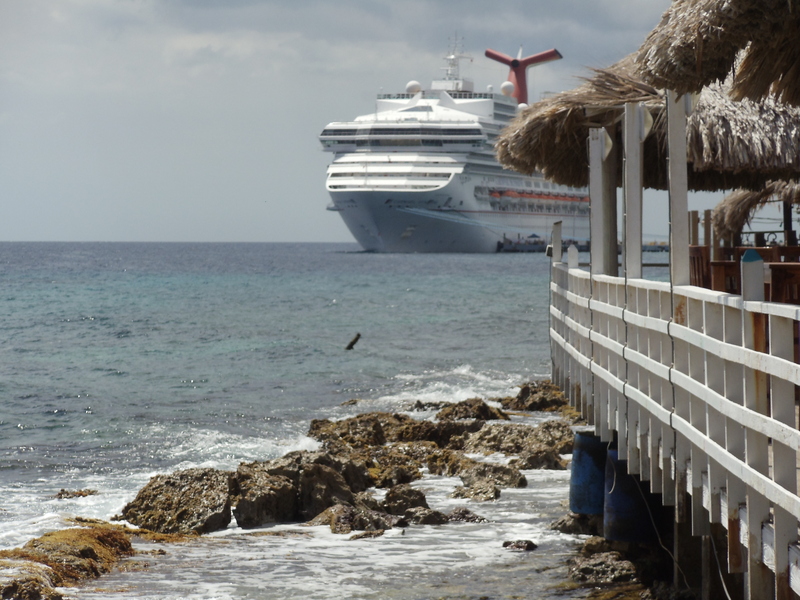 I think the tourism board would do much better – if instead of stating that many pirates were driven off from Curacao’s forts – that on the contrary, Curacao’s taverns, brothels, and harbor were full of pirates spending their ill-gotten loot, resting up, recruiting and planning their next nefarious venture while trying to look as respectable as possible while in port. To me that is much more interesting anyway – and probably supported by gobs of historical evidence as well if one were just to dig for it a little. 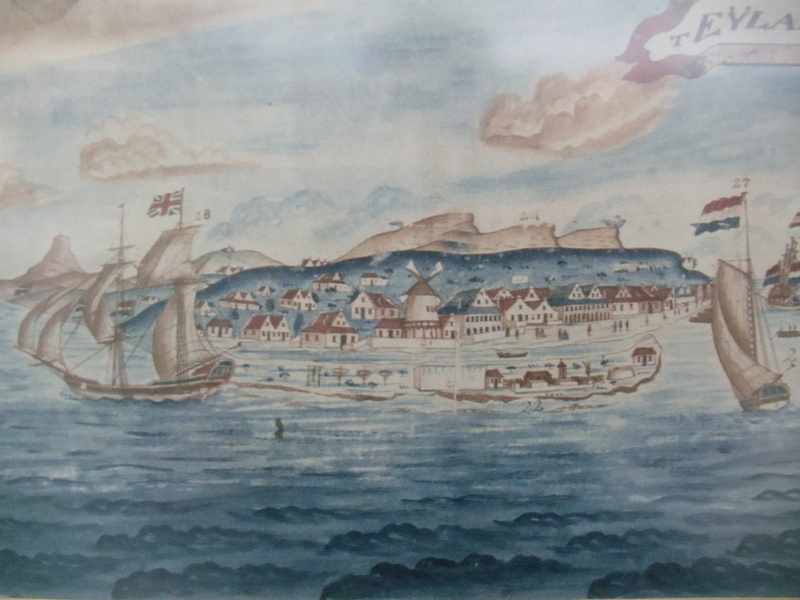 Also in the 1791 illustration notice all the different flags flying from ships already in port. 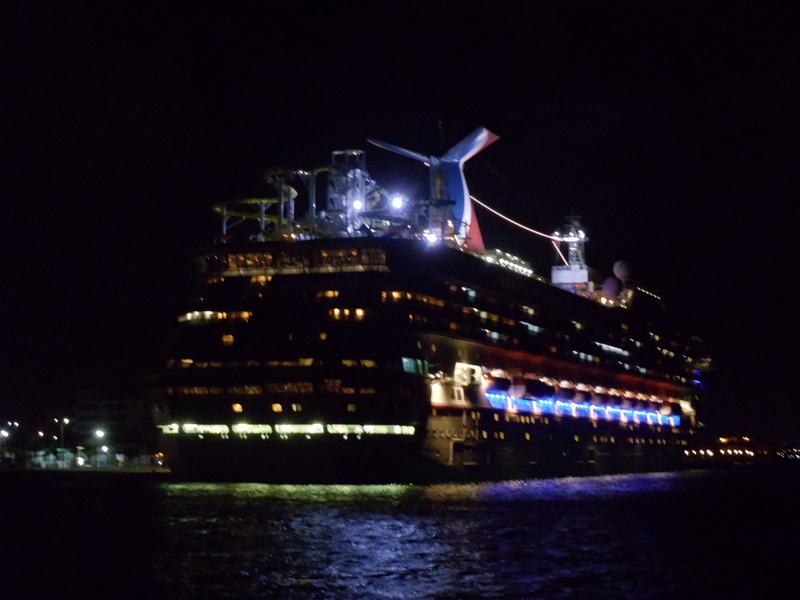 I see British, Danish, Spanish, French, and even American flags on the ships in the harbor. 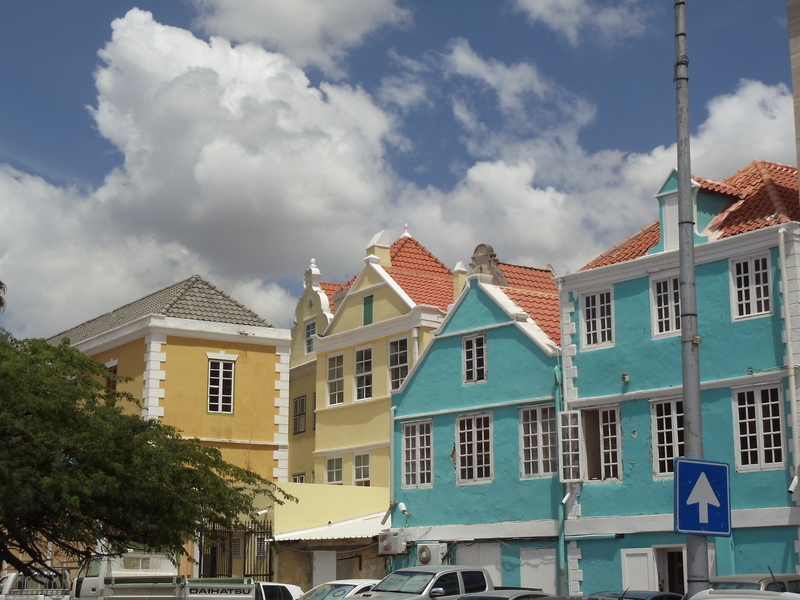 To this day Curacao is an amazingly diverse multicultural place! 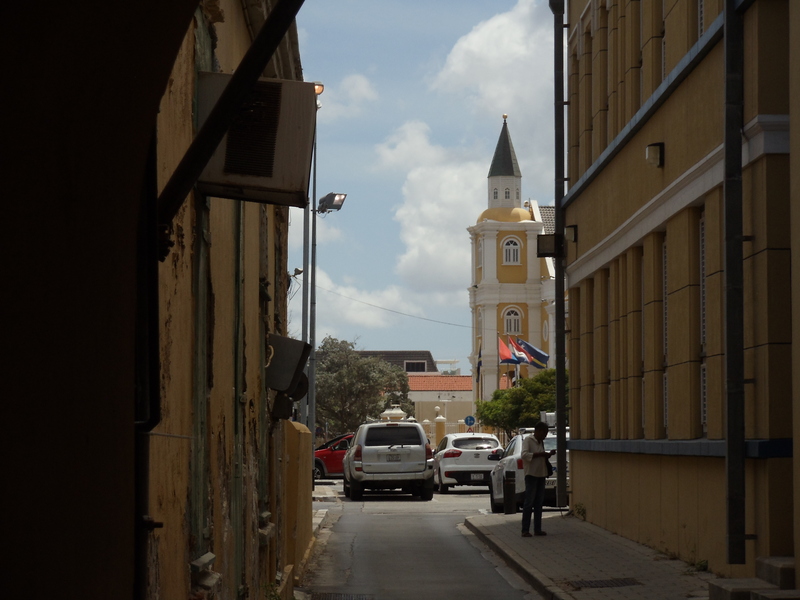 Many Venezuelan people immigrated to Curacao over the last three centuries for work. 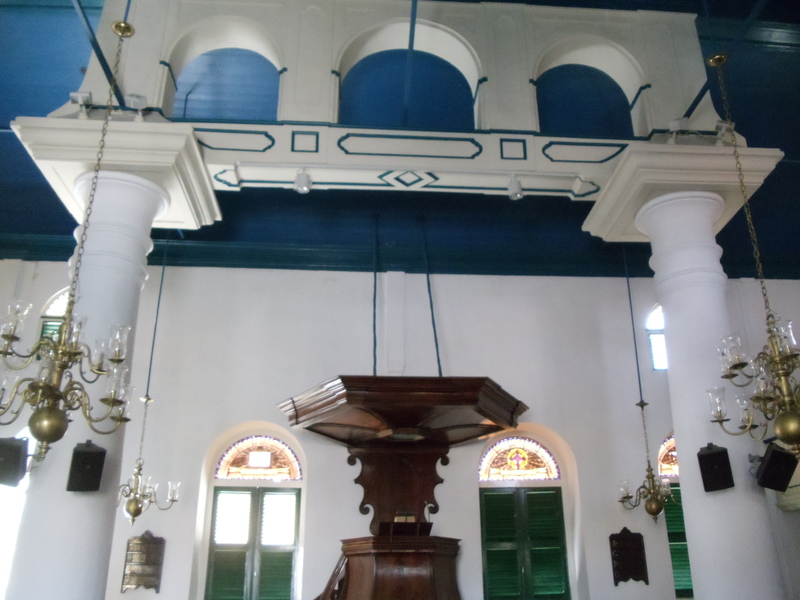 In addition Curacao used to have a very large and lively Sephardic Jewish community who were very much responsible for much of the island’s financial prosperity. 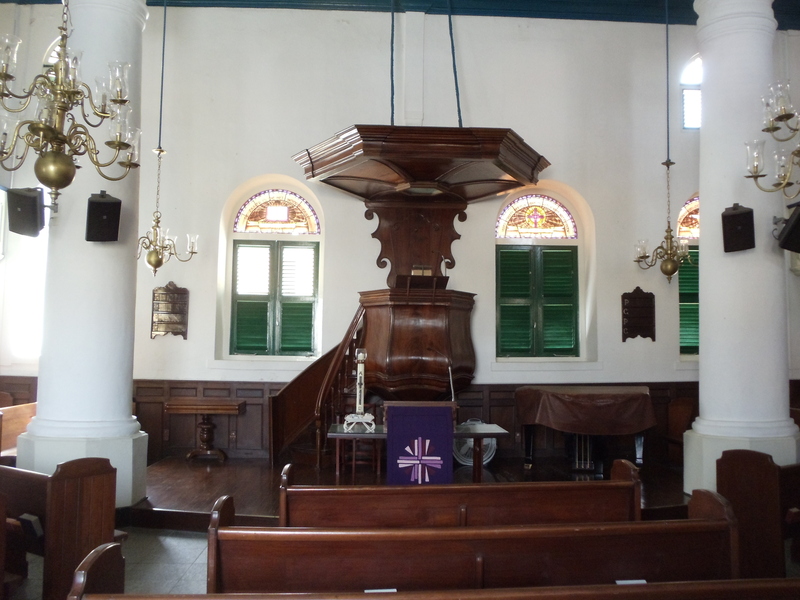 In fact the oldest continually functioning synagogue in the western hemisphere can be found in old Willemstad. 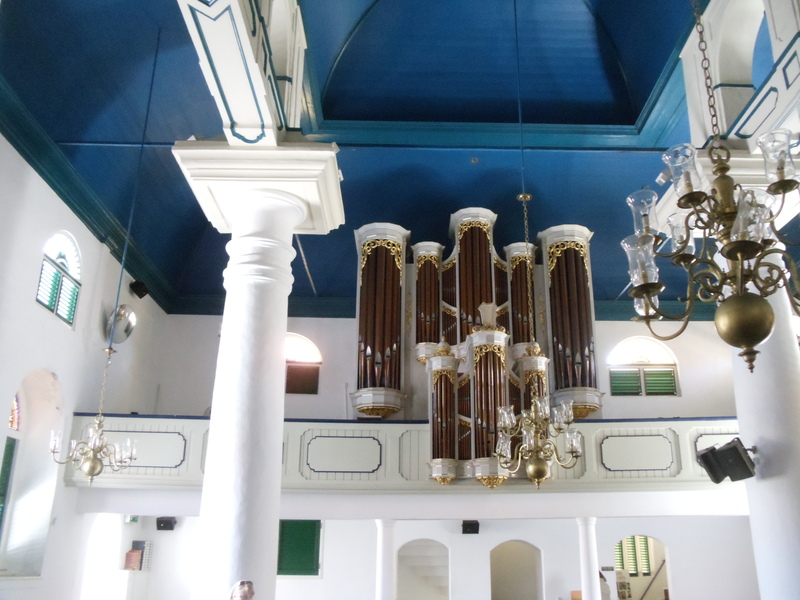 Built in 1651 by Jews that were fleeing the persecutions of the Portuguese Inquisition, Curacao benefited from these immigrants. I wrote about the Jewish contributions to the Dutch Republic in my short story on Piet Heyn HERE: STORY I was surprised to see an armed guard when I entered the place, but I suppose one shouldn’t be too surprised considering the valuable items contained within. 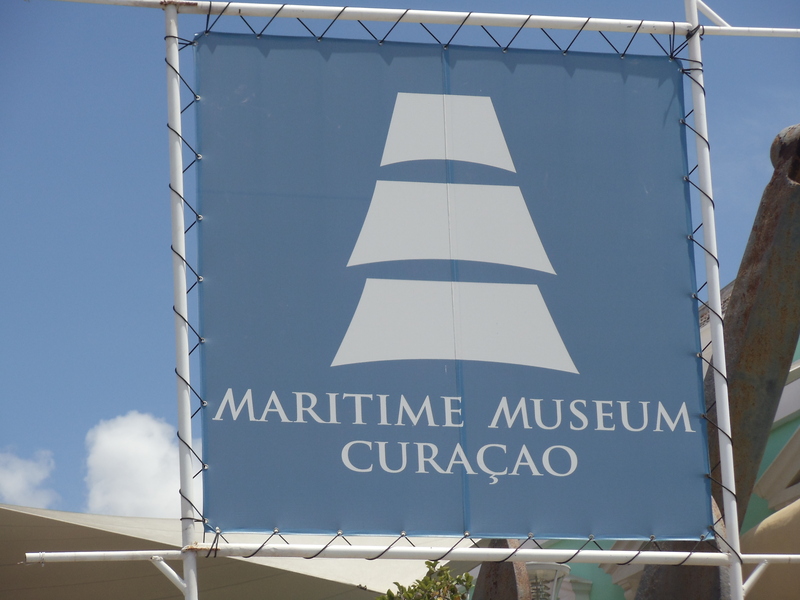 ….we made our way beyond the floating market across the canal to the Curacao Maritime Museum. This is a pretty good little museum with descent displays and information. I was elated that they had a collection of models but was disappointed in their condition. Many of the models are damaged and require restoration or repairs. Some are simply old kit models or uncompleted attempts. Still they are fun and interesting to look at. A few were not correctly classified but I am used to that. The building has an interesting history. It was once a private residence and a sanitorium/hospital which was gutted by fire before it was acquired to become the maritime museum. The floors were never rebuilt and as a result the place is very spacious and the levels can be accessed by stairs, a metal spiral staircase, a ramp, and catwalks which encircle the inner space of the central area with historic displays. Its very different and interesting. 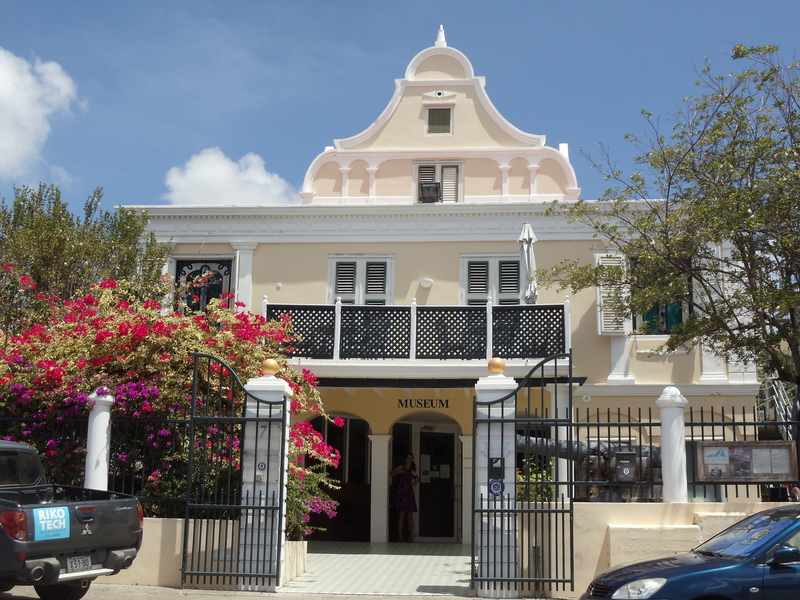 By wandering through this building one is educated on every era of Curacao’s maritime history and development, from the first wave of Dutch conquerors to the commercial oil and gas development of the 20th century. 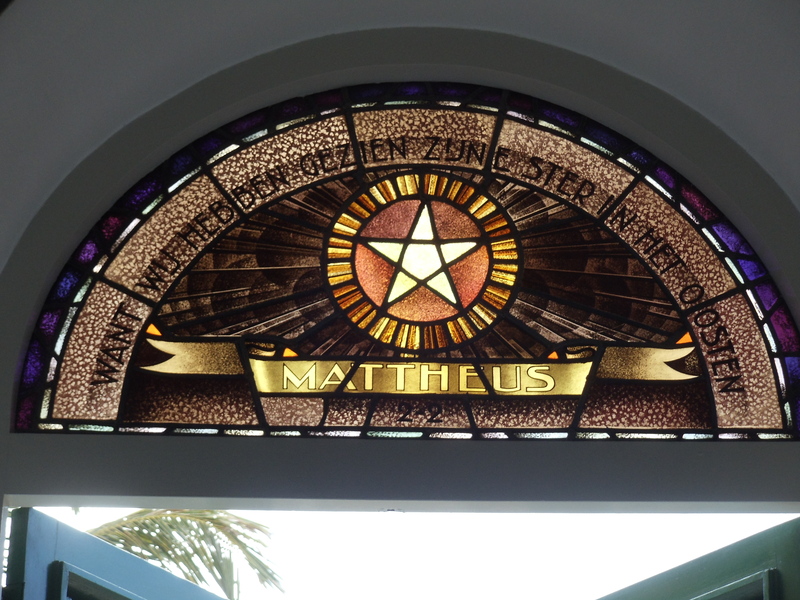 On the very top floor is a display dedicated to the modern Dutch navy. It was very interesting and informative. 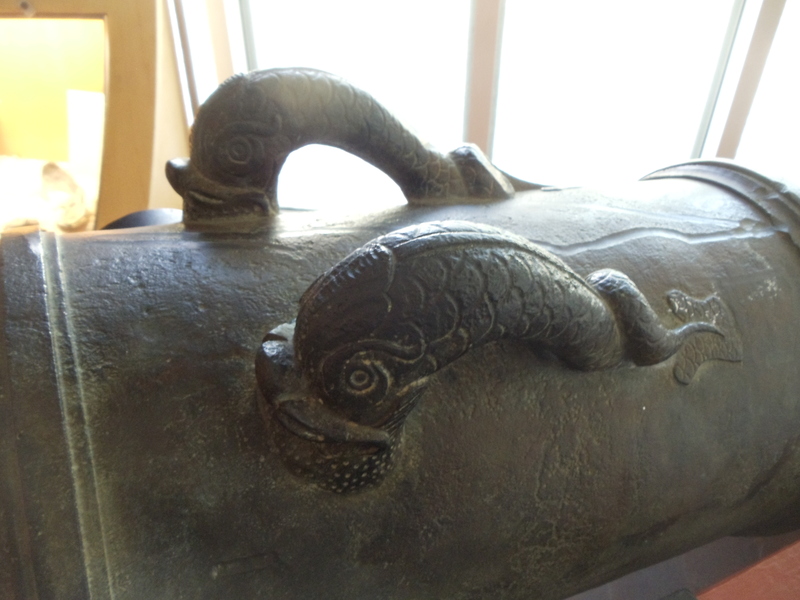 I especially liked the Dutch bronze 6 pounder bow chaser that was recovered from the Dutch frigate Alphen. The Alphen exploded from unknown causes in the harbor in 1778 and has been archeologically excavated. Frigate Alphen I also managed to find a very comprehensive and well illustrated book on it there (in Dutch) that I purchased for 40USD. Many of the illustrations are from the Golden Age and there were a number I had not seen before. I also enjoyed a little room on the second story full of plaques and books(many of which I already own), pictures and photo albums. There were a few other Americans in the museum and the staff showed a little 20 minute or so long movie in English that explained the history of the area. I couldn’t bare to watch the entire movie because it was wrought with inaccuracies. The straw that broke my back (and some of you who know me are really going to get a laugh here) was when they began to talk about pirates. They started by describing the acts of Sir Francis Drake. Then they described the Golden Age of Piracy as occurring “in the middle of the 18th century” (What?) and then they preceded to glorify Blackbeard as the greatest pirate ever. (UGGGH!!!) I almost pulled my hair out. As we all know here on Buccaneer’s Reef, the Golden Age of Piracy was over about 1725 – in the first decades of the 18th century. The greatest pirates and most audacious acts of piracy had occurred from 1660-1690. 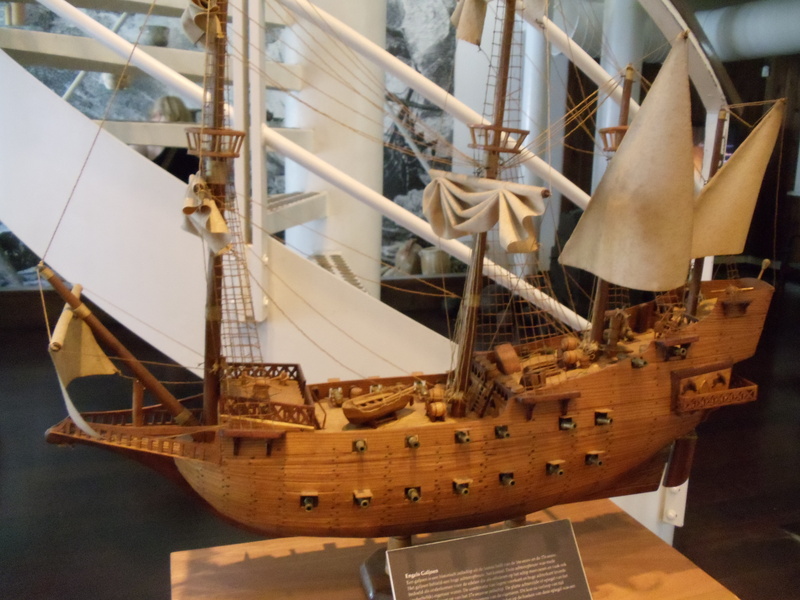 This was really amazing to me because the Dutch had some of the most notable pirates in history during the great age of piracy – with infamous pirate lords like Laurens de Graaf who commanded whole pirate fleets against all flags. His raid on Vera Cruz in 1683 is one of the greatest piratical acts of history. 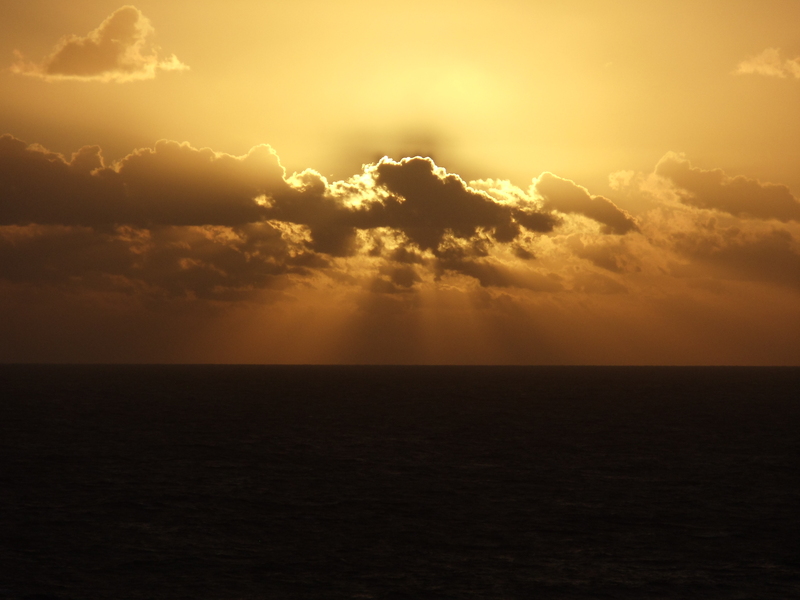 He made off with the entire Spanish gold reserve meant for the annual treasure fleets. It’s extremely likely that a large portion of this treasure haul made its way to (and was spent in) the free haven of Curacao as many of his captains were Dutchmen. 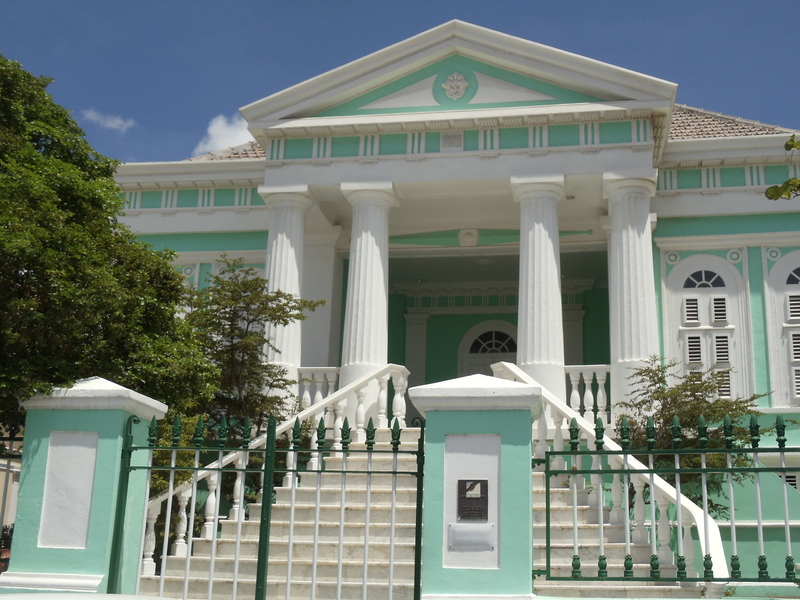 We know that DeGraff himself spent time in Curacao in order to make repairs. The famous Dutch pirate entered the port on January 20th 1685 with a flotilla of pirate ships aboard his flagship the Neptuno (the renamed Spanish War Galleon San Fransisco he had taken from the Governor of Cartegena as “a Christmas Present”), SEE: The Truth about the Perfect Pirate Ship — How about a display dedicated to this event eh? – now that would be cool! I mentioned the bad inaccuracies in the movie to the ladies in the museum staff as I was leaving and they replied that perhaps I could make a better movie. I don’t know if they were actually serious or not, but I absolutely COULD and would love to do so. I would even work very cheap. In my consulting work I usually charge $150.00 an hour, but I would work for a fraction of that fee to give them something really good simply because of my passion for the subject…. possibly even pro-bono (with the exception of free lodging and meals while I was there). 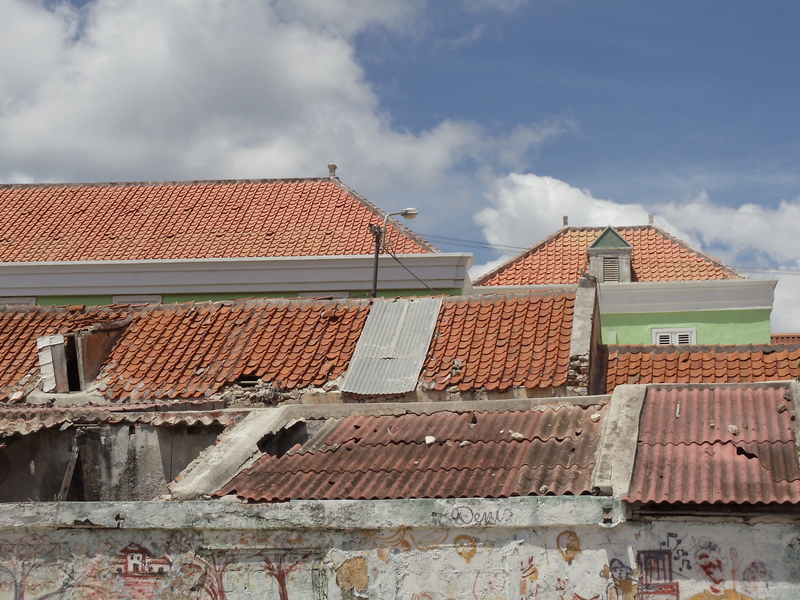 We explored the area behind the museum as well and clearly Curacao has some areas more run down than others, which make a very interesting contrast to the bustling Punda shopping district just a short walk away. I also find some of the names of the areas fascinating that the shopping district name “punda” is a very common name found in many of the former Dutch East Indian colonies now in modern Malaysia. The Otro-Banda district across the St. Anne channel could be a bastardization of Spanish meaning Otro(Another) and Banda which in Spanish could be “strip” or is it named after the well known(at the time) legendary Banda islands in the Dutch East Indies which brought the Dutch vast and untold riches. I would be interested in the origins and etymology of the name from a local expert. After the museum, my lady friend and I were quite hungry and so began looking for somewhere to eat a late lunch. I wanted to try one of the places I had glimpsed earlier, built into the old walls of Fort Amsterdam. 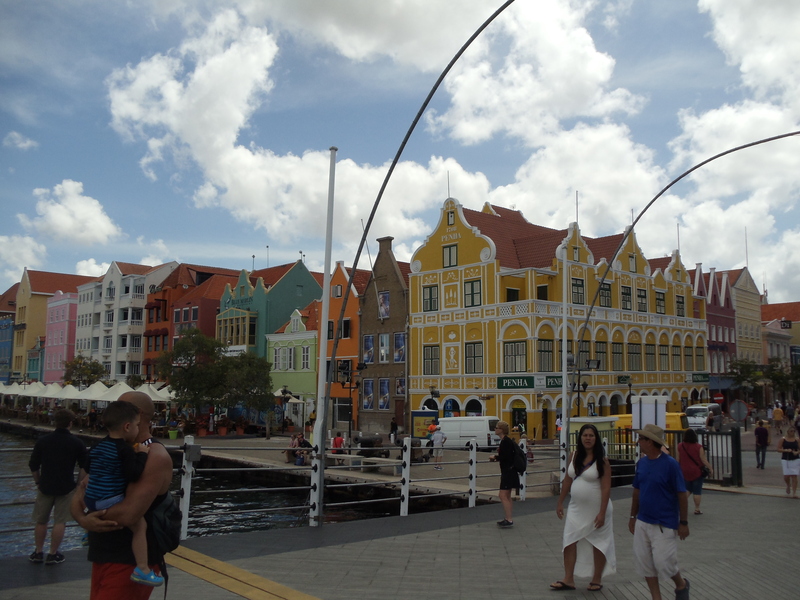 So we made the 15 minute walk back across Willemstad (once again) and boy was I ever glad we did! The food we enjoyed was quite simply fantastic! WOW! We had never tried conck before so we both ordered tenderloin medallions and conck and a fine old port to drink with it. I was expecting the kind of portions one would get in the States. Boy was I surprised! Instead of the tiny little medallions I am used to at Outback or Texas Roadhouse, I got two beautiful steaks that looked like they were at least 8 or 10 ounces each! They were so tender, juicy and flavorful that I wondered if there was just another level of yumminess I had never experienced before – above what I have come to expect from American beef (which I love) over the years. 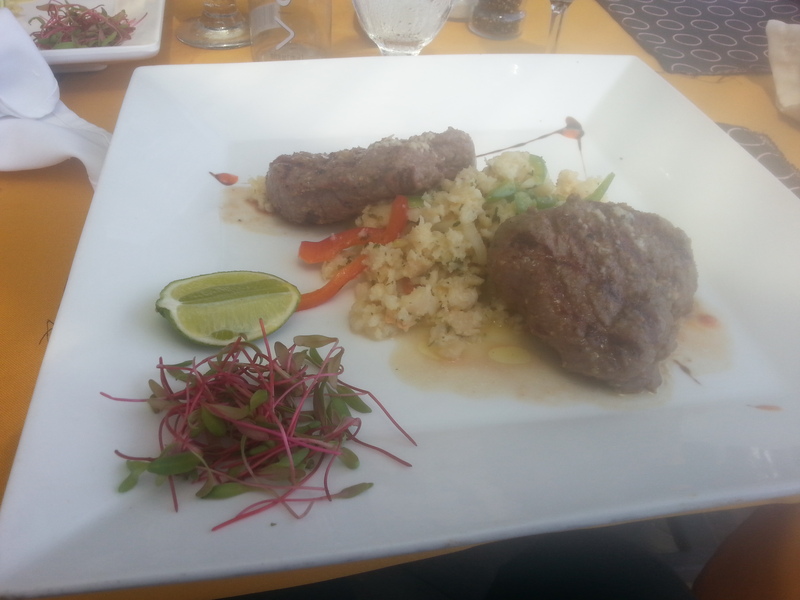 The helping of conck on each plate was immense – a HEAP! I expected a few table spoons full and got probably 18 ounces of the wonderful shell meat. It wasn’t as chewey as I expected and although it had a mollusk taste its texture and flavor felt like I was eating clams, crab and maybe muscles combined. It was delicious! The port was a little on the expensive side for a middle class retired American military officer like me, and the glasses a little on the small side, but it was very good and complemented the tenderloin well. I only spent a day in Aruba and must go back again for a much more thorough exploration. 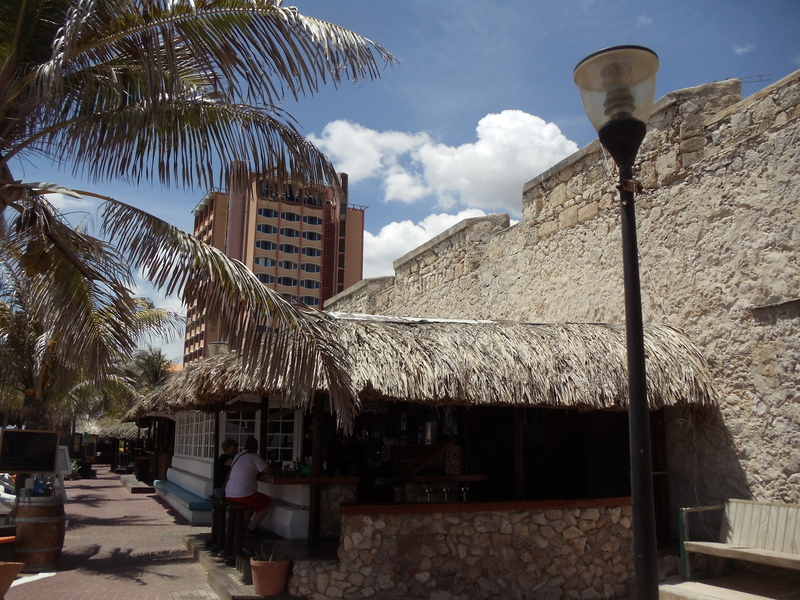 Aruba is much less historical in nature and much more oriented to tourism. 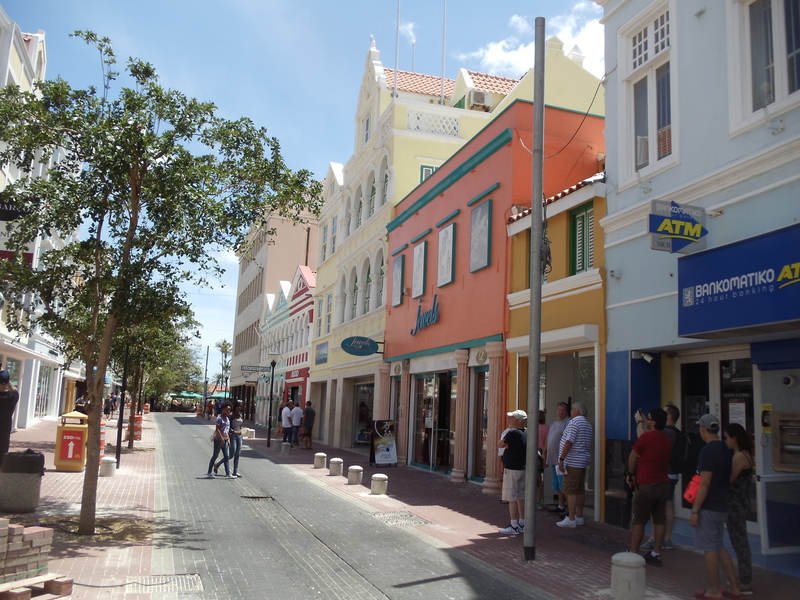 Even most of its gabled store fronts in the city of Oranjestad are faux in nature built in the 20th century to evoke the stylized Dutch Golden Age architecture we see in Willemstad. Its large casinos, elite and expensive famous designer brand boutiques and shops (geared to the tastes of the wealthy) – and its beautiful beaches make it feel much more “resorty” than Curacao. Historically the Indians were left alone by the Dutch who allowed them to raise cattle to be exported to Curacao. Aruba has the look of desert terrain and high desert plains that we commonly see in the North American west. I managed to find the museums right off and indeed much of the main museum showcases artifacts of a pioneering nature. It felt more like I was in an old west museum in the US than in the Dutch West Indies. 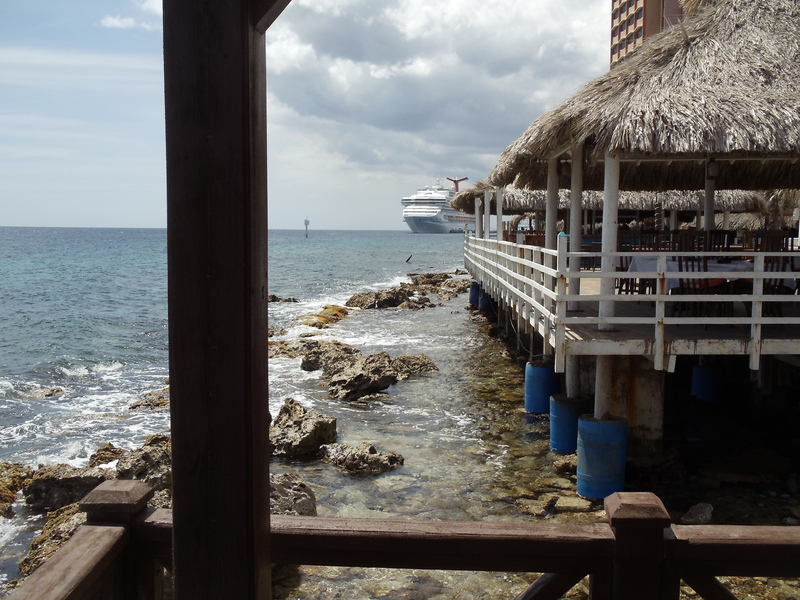 Who knew there was a Dutch Caribbean colony with a history closer to Deadwood or Tombstone than to Pirates of the Caribbean – certainly not I. Aruba’s most bustling period occurred as a result of the discovery of gold there in 1824 and the subsequent gold rush. The museum sits inside an old fort called Fort Zoutman. Indeed, taking a look at the old maps again, there has been a fort on this site since the 1600s(probably a wood stockade like I illustrated above) but this manifestation of the fort was dated to the 18th century. The fort even reminds me of many of the old western frontier forts of the US – old Fort Sill for instance. 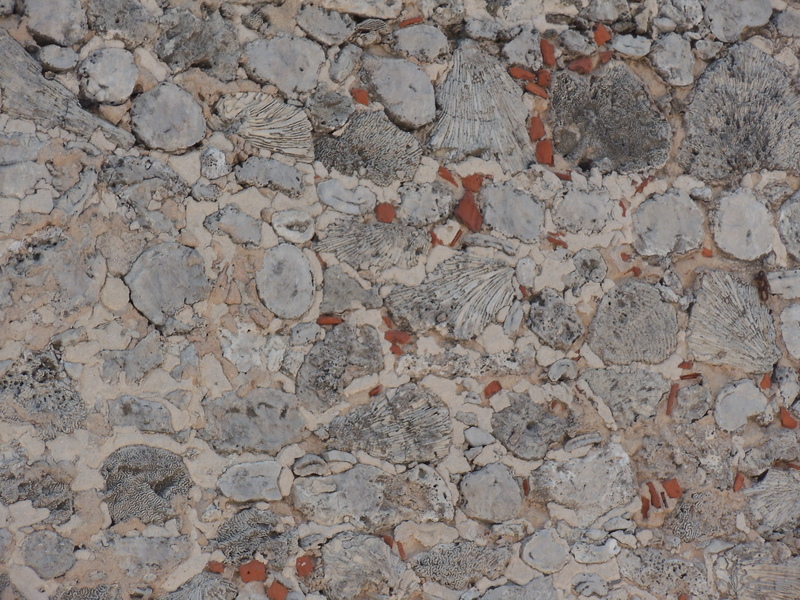 The stone blocks are mostly quarried from coral reef much like Fort Amsterdam or the fort at Saint Augustine. There are only a few now empty cannon emplacements and many angled loop holes around the entire circumference of the roughly star shaped bastion for small fire-arms. 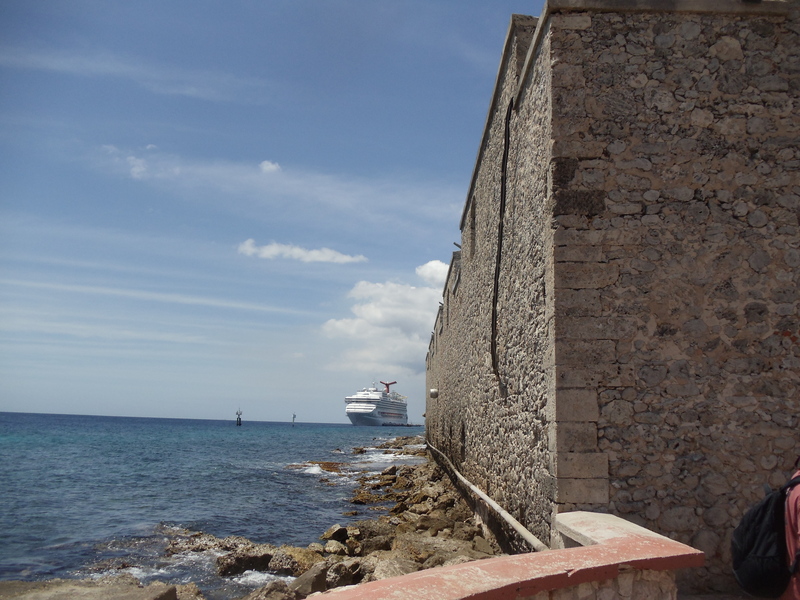 This is a little fort that was once right on the waterfront according to old paintings. However now it is a bit more inland and surrounded by buildings and urban sprawl. The views and fields of fire out of the loop holes that would have at one time presented open terrain to fire upon unwanted invaders – are now filled with the backsides of buildings, houses, trees and streets. In many cases one would only be able to fire three meters across into the next wall. Its a relic of times long passed overtaken by progress. I went back in time for a moment and imagined what it must of looked like when it was here almost alone. I do that often when I explore places like this. There used to be a fine numismatic museum here and I was looking forward to checking out the collection and possibly buying a coin or two as I am an avid collector myself. However the coin museum and shop have been closed for months and I have no idea if it will open again. Another disappointment. 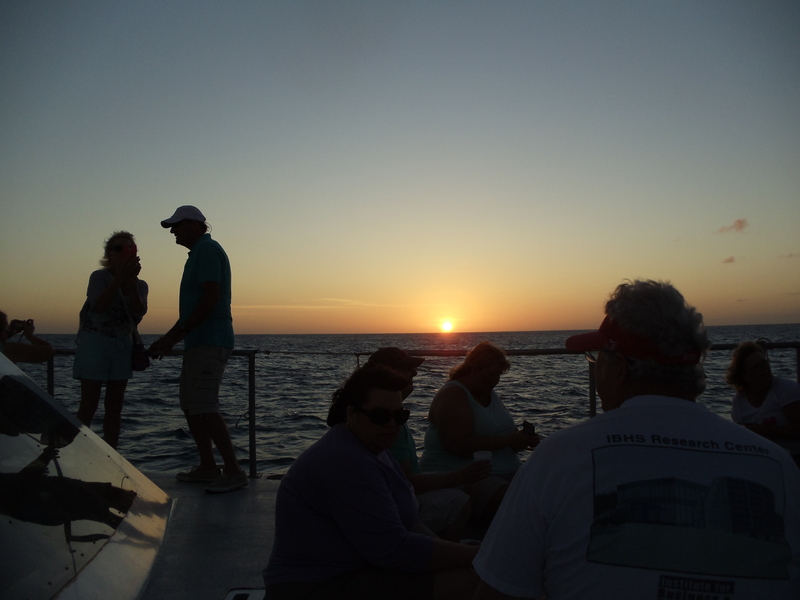 Later that day we did take a catamaran trip – sailing around that side of the island and watched the sun go down while we consumed delicious fruity tropical alcoholic drinks. It was wonderful. I will be going back soon. 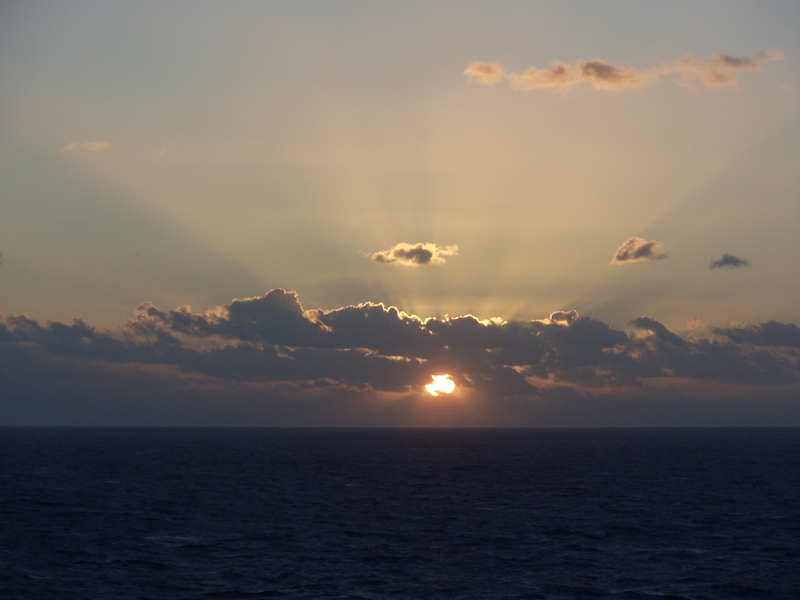 The sunsets in this part of the world are breathtaking and I can’t believe I never made more of an effort to come down this way before. 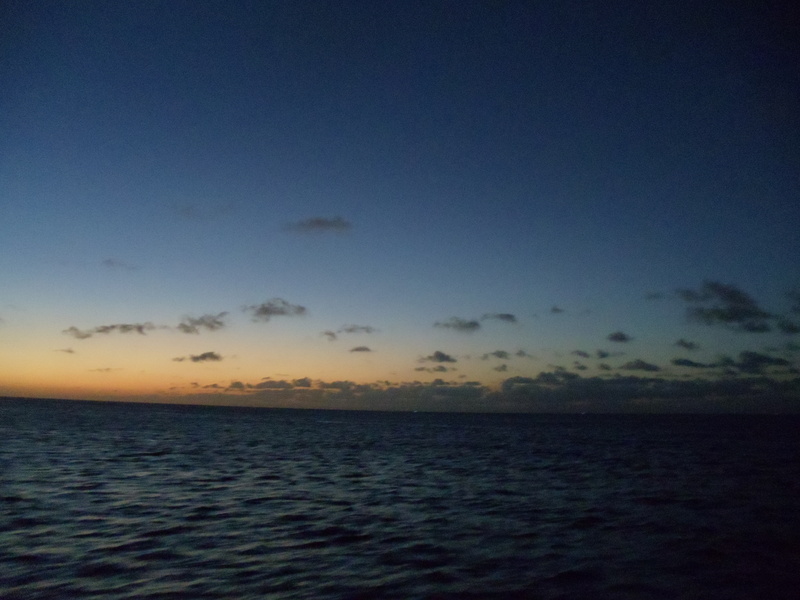 On my way back to the US we stopped at Turks and I may write about that some in the future. I will just say it had nice beaches, but it paled in comparison to my experiences on the Dutch islands. 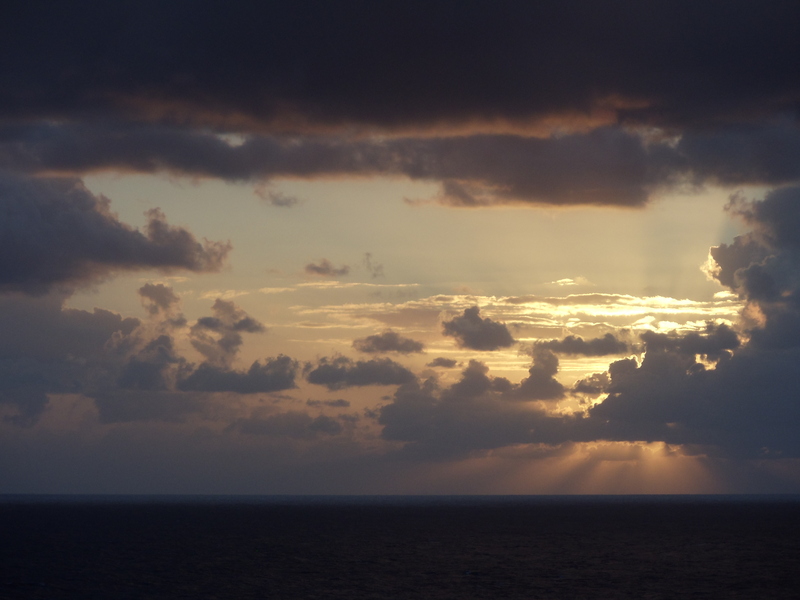 I leave you with views of the sky – some of which I plan to incorporate as new skybox views in the new weather effects I am working on for the upcoming patch to our favorite video game. This was one of the best trips I have taken in my entire life and when I say I plan to go back, I mean in just a few short months after some other business I need attend to. I hope you enjoyed this account of my latest adventure and observations.